From the moment a child is born, the learning begins. By kindergarten, gaps in skills and knowledge for some children have set in that can last a lifetime. Over the past two decades, a growing body of research has helped bring the importance of the early years into greater focus. High-quality early childhood education and care are increasingly considered critical levers in supporting children’s development, school readiness, and long-term life outcomes. 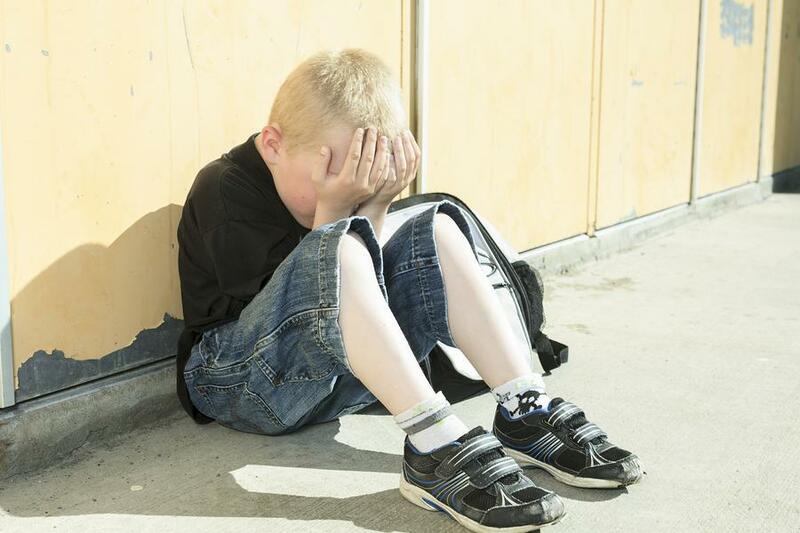 At the same time, adverse childhood experiences have been shown to have long-lasting consequences on learning and behavior as well as on physical and mental health. The field of early childhood education faces a host of challenges: Funding is fragmented, access and quality are uneven, and services to the youngest children are limited. Worker pay is so low that about half of child care workers are on public assistance, research has found, while costs make early care and education unaffordable for some parents. In the face of these challenges, some states have moved to increase access to early childhood education. 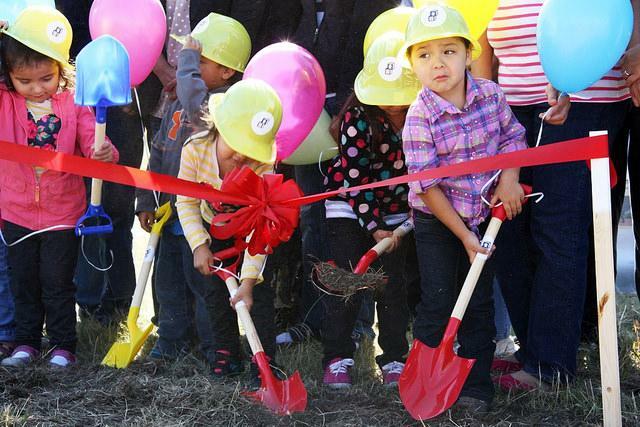 One area that has gained traction among policymakers is state-funded preschool programs. States including Florida, Oklahoma, Vermont, and Wisconsin, plus the District of Columbia, now serve more than 70 percent of 4-year-olds in such programs, according to data from the National Institute for Early Education Research at Rutgers University. The early years are key, experts say, because the brain develops at the fastest rate in young children – particularly birth to age 5. It is easier and more effective to influence a baby’s developing brain than to try to make up for deficits later, according to the Center on the Developing Child at Harvard University. In most states, early childhood education outside the home is delivered in an often fragmented system of providers, including home-based and center-based child care, as well as schools. 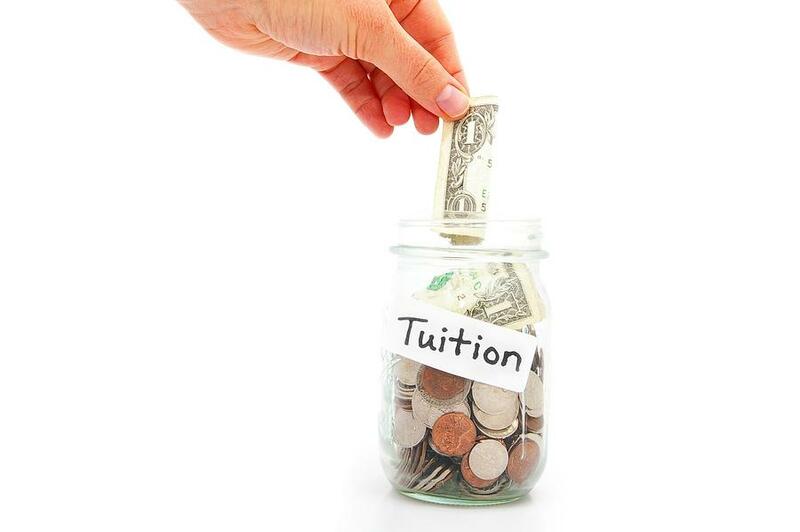 In addition, funding is typically patchwork, with support from various sources, such as federal, state, and local governments; school districts; charitable organizations; and individual families. Some early learning programs voluntarily seek accreditation from the National Association for the Education of Young Children. Some states use quality rating and improvement systems, which may award stars or other ratings, to hold programs accountable. High-quality programs have children interacting with caring adults and engaged in active hands-on play and learning, experts say. 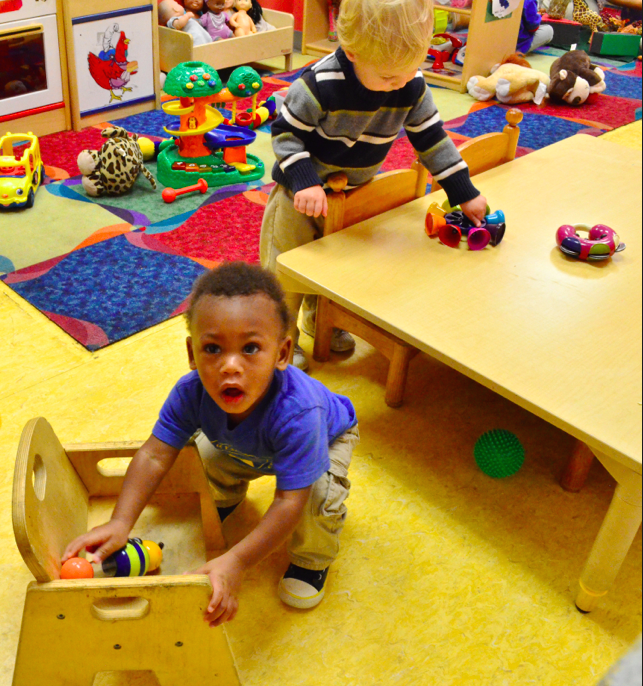 One of the best-known early childhood programs is Head Start. The federal program serves low-income families, with a focus on children from birth through age 5 as well as pregnant women. The federal government also supports other early childhood programs, including the Early Childhood Home Visiting Program aimed at pregnant women and families with children from birth to kindergarten. Nurses, social workers, or child development specialists work with families to help them understand developmental milestones in children and build positive parenting techniques. Research shows that high-quality home-visiting programs can increase children’s school readiness, health, and development, according to the nonprofit Zero to Three. One big challenge to quality, some experts say, is the notoriously low pay for many child-care educators, who typically earn far less than their K-12 counterparts. The 2017 median pay for child care employees was $10.72 an hour — $22,290 a year — according to the U.S. Bureau of Labor Statistics. At the same time, child care can be unaffordable for parents. Sometimes federal subsidies help to reduce the cost of child care for parents who are working or in training, via the Child Care and Development Block Grants program. Below is a list of resources to help journalists learn more about a variety of issues related to early childhood education. Children’s early experiences can have a lifelong impact on learning, social and emotional development, and physical health, according to a robust body of research. Parents or guardians are children’s first teachers. Singing, playing, counting, reading stories, and surrounding infants with love and nurturing help children’s brains develop in strong ways. 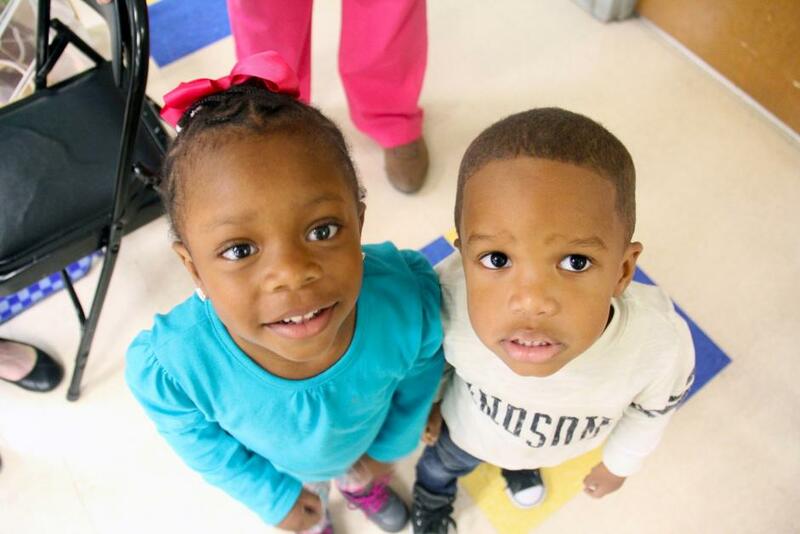 One of the best-known federal programs for early childhood education is Head Start. Started in 1965, Head Start programs serve children from birth to age 5 as well as pregnant women. More than 80 percent of the children served are 3 or 4 years old. Most of the children meet poverty guidelines. Children who are in foster care, are homeless, or are in families receiving public assistance are eligible regardless of income level. What Are Signs of Quality in Early Learning Settings? 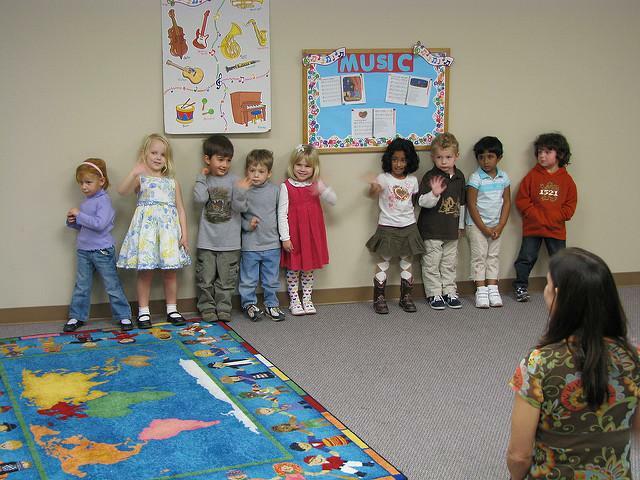 There are numerous ways to judge the quality of early childhood education settings. Some programs voluntarily seek accreditation from the National Association for the Education of Young Children. NAEYC sets standards in 10 areas, such as staff qualifications, curriculum, physical environment and relationships with children and families. When it came time for Kristina and Jason Salguero to send their son Austin to daycare, they were shocked to learn that it could cost as much as it would to send him to college. 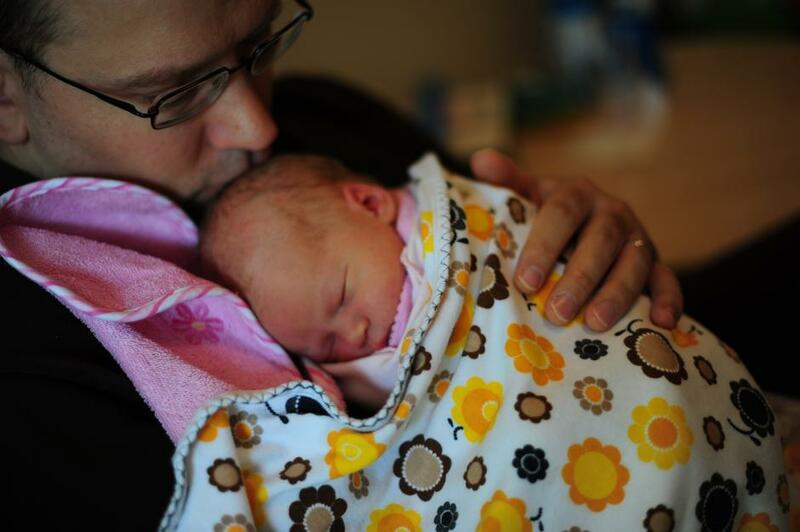 They enrolled Austin, but decided to put off their plans to have a second child. “It’s like they don’t want us to have children,” Kristina says. This led her to write to WAMU’s What’s With Washington. 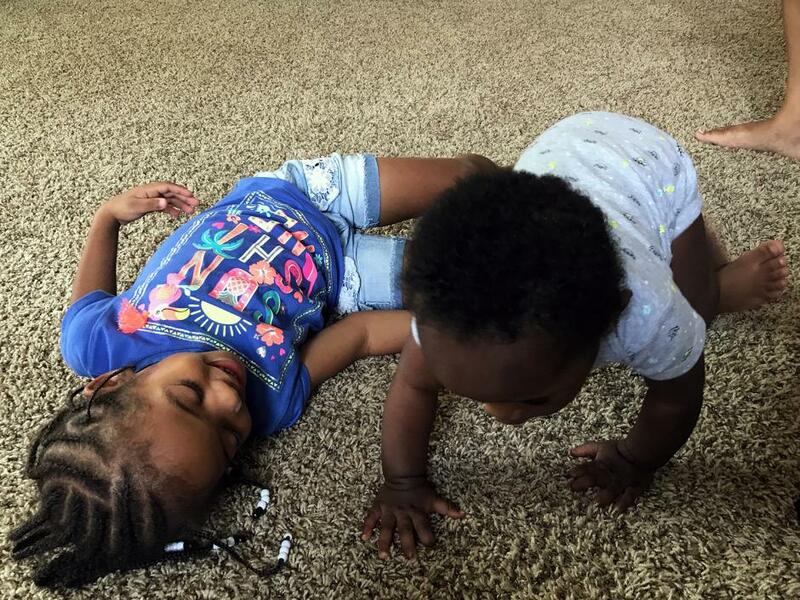 “Why is daycare so expensive in the D.C. area, particularly in Montgomery County?” she asked. Accustomed to being called AJ by his family, Antroine didn’t recognize his name in print. His mother, Janice Barton, felt ashamed when she learned some of his peers were already writing their names — until she learned many others weren’t prepared for kindergarten either. Democratic presidential hopeful Elizabeth Warren is proposing a $70 billion-per-year universal child-care program that would provide free care for up to 12 million children, her aides said Monday. In gubernatorial races across the country last year, calls to expand pre-K and other early childhood programs were popular campaign talking points. With many of those candidates now in office, 2019 could prove to be a big year for action by policymakers on early learning. When federal officials inspected this city’s Head Start program five years ago, they found moldy classrooms, exposed wires, leaking sewage, a sagging roof and trash-strewn playgrounds littered with safety hazards. 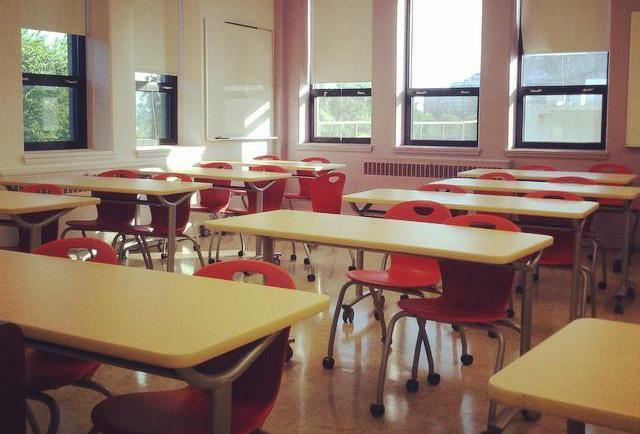 A teacher had jerked a student so hard she dislocated the girl’s shoulder. The visitors were so alarmed at the neglect that they began changing diapers themselves. What they did next was even more unusual: They fired the nonprofit running the program, the Urban League, and chose a new one. Will Cursive Make a Comeback? Has any part of the curriculum come back from the dead as many times as cursive handwriting? 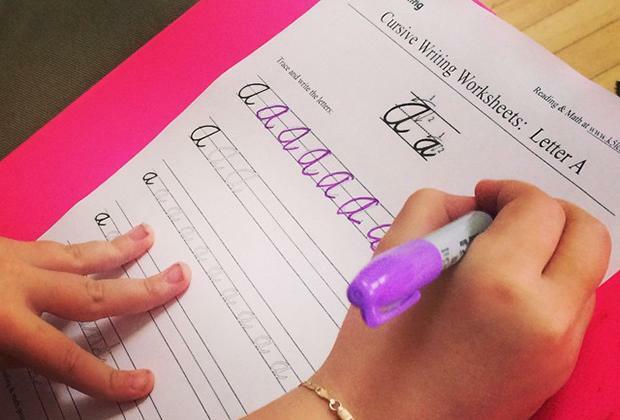 From Connecticut to California, lawmakers are alternatively fighting to either mandate or ban cursive instruction, in some cases leaving the verdict up to individual districts and schools. The latter is the case in Maine, reports Noel Gallagher of The Portland Press Herald, where the cursive debate offers a window into the state’s long-held preference for local control. What are some surprising ways mastering the art of cursive writing might help students, according to advocates? And where should reporters be skeptical about claims of purported benefits, particularly when it comes to brain development in younger students? Visiting a classroom while reporting on education issues is a core part of understanding how instruction takes place. But it can also be a missed opportunity, without careful thought and planning. 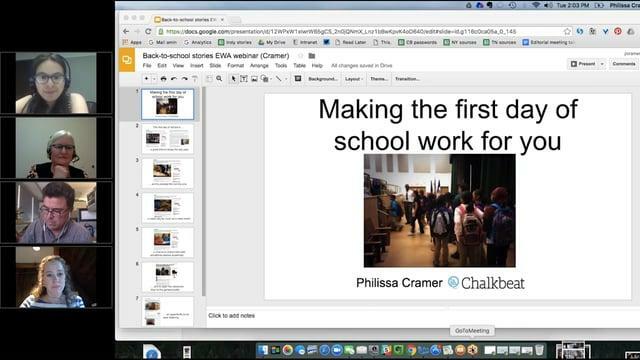 If reporters don’t ask for a lesson plan in advance, for instance, stick around after students leave to speak with the teacher, or even make plans for a return visit, they risk failing to make the most of this on-the-ground reporting. Many of the nation’s top preschools have found that the magic ingredient in supporting kids and boosting their academic success is involving parents and providing intensive support to families. Christopher House, a nonprofit that runs a high-performing elementary charter school and a small network of public preschools in some of Chicago’s poorest neighborhoods, has infused parental support into its model. Full-day Kindergarten Is Great for Kids, so Why Isn’t It Required? The academic gains of kids who attend full-day kindergarten are well-documented, but most states pay only for half-day kindergarten and don’t require students to attend it. Early learning advocates and politicians have spent a lot of time in the past five years talking about preschool. But for the benefits of preschool to be sustained, experts argue, children must continue to receive a high-quality early elementary education. Full-day kindergarten, which has been shown to boost academic gains for students well into elementary school, could be critical. If you think about education reporting as covering schools and the students who attend them, you might be scratching your head as to why infants and toddlers are newsworthy subjects. But if education reporting is really about covering learning, then children under age 4 are some of the best subjects you could imagine. Child Care ‘Deserts’: What Are They and Where Are They Located? Early childhood education is rarely a beat education journalists can cover exclusively. But the need for quality coverage is great, especially as more and more state governments, private foundations, and districts zero in on early childhood education as a place for greater investment. Patricia Twymon set her jaw and spoke slowly and firmly. How Should the Government Support Families? Government agencies give lip service to the importance of high-quality child care and early learning programs, but the patchwork system of tax breaks and government grants has too many gaps, causing many families to struggle with bills. And many communities have too few options for high-quality early learning opportunities. That was the consensus of a panel of experts who spoke at the Education Writers Association’s early childhood conference Nov. 6 and 7. They debated however, the causes of and potential fixes to the problems – ranging from taxes to grants to privatization. The evidence base for early childhood education expanded last month with the release of two reports that, together, analyze the outcomes of more than 100 early childhood interventions. The reports, from the Rand Corporation and the American Educational Research Association (AERA), find short- and long-term benefits for children and families, and identify potential cost-savings for schools and government. At What Age Should Kids Start School? In France, school can start at age 2. Is that too young? Diana Rauner advocates for early childhood care and education today because of ex-offenders. The now-first lady of Illinois was working on Wall Street years ago when she began volunteering at a local settlement house, teaching ex-offenders how to read. She remembers being astonished that somebody her age could not know how to read. “That really was when I decided to start thinking about educational inequities,” Rauner said at a recent Education Writers Association conference on early learning at the Erikson Institute held in Chicago Nov. 6 and 7, 2017. Lectures don't work well for young children. Look instead for child-directed fun. In some classrooms she visited, children counted numbers as they did jumping jacks, author Suzanne Bouffard said. In others, teachers lectured as children sat quietly, nearly whispering answers to questions as if scared to say the wrong thing — something you never want to see a 4-year-old do. The stark differences among these preschool classrooms illustrate what years of research have documented, Bouffard said. 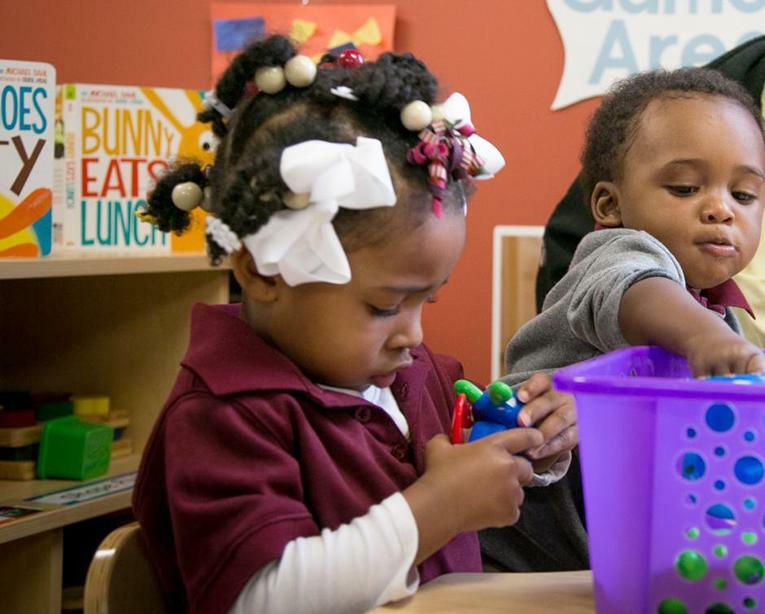 “An impossible equation.” That’s how Phil Acord describes the challenge of keeping afloat a high-quality early learning program that serves children from low-income families. 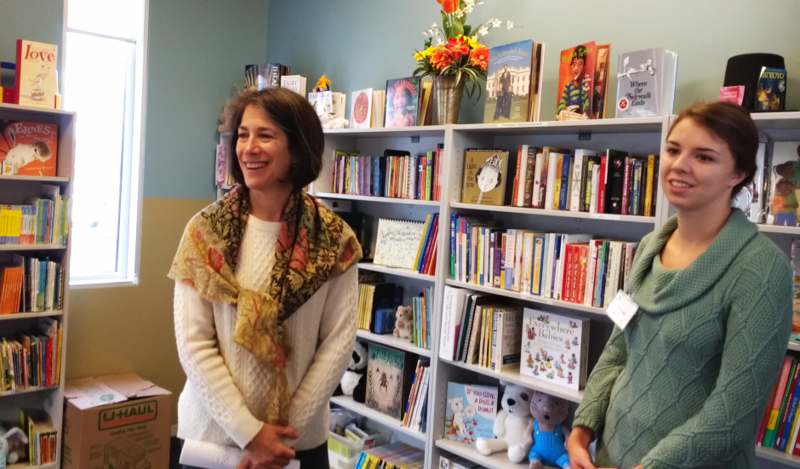 As the president of the Chambliss Center for Children, a nonprofit organization that provides around-the-clock care and education to young children in Chattanooga, Tennessee, Acord knows well how difficult it can be for child care providers to simply keep their doors open each month. 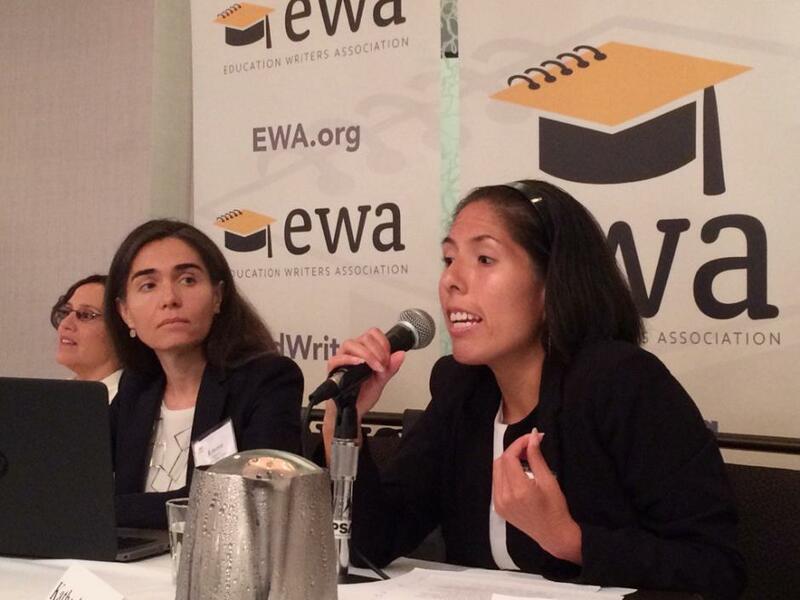 About 45 education reporters gathered in Chicago this week for EWA’s two-day seminar on covering early learning. They got a primer on early education research and the complex web of funding sources for zero-to-five education and care. 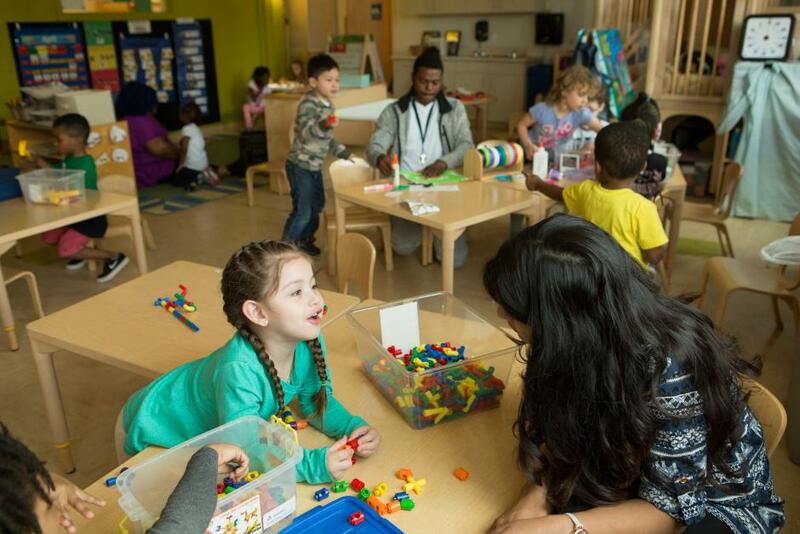 Reporters visited highly recognized early learning centers in the Windy City and got tips on what to look for during visits. 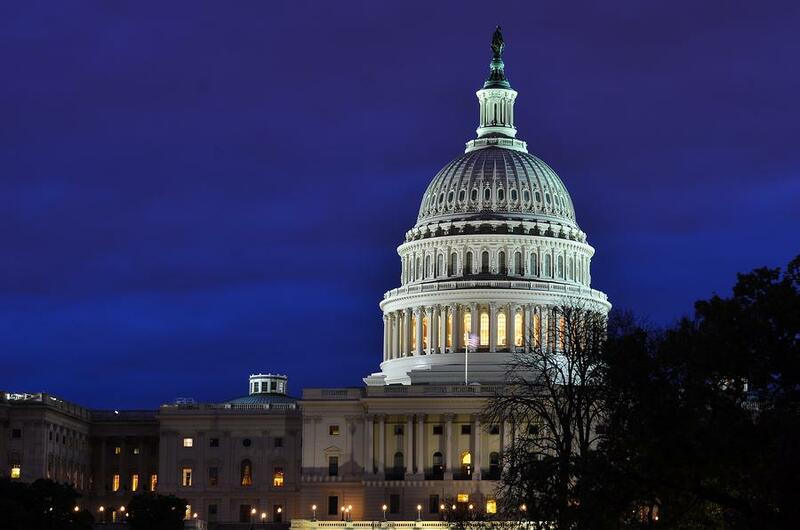 Action on Capitol Hill to address early childhood care and education is heating up, with key deadlines looming and critical legislation pending. Last week, Democrats in the House and Senate introduced an ambitious child-care plan, while a House panel approved a bill to extend a popular federal home visiting program that seeks to help low-income families raise healthy children. 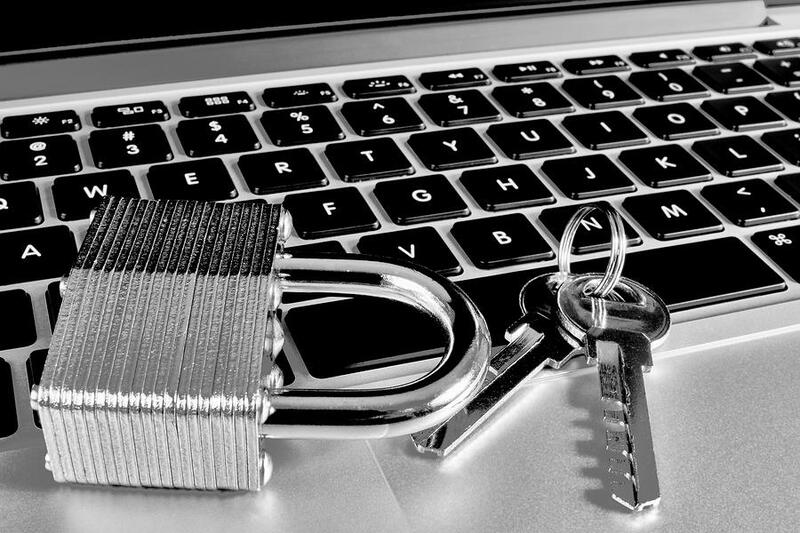 That program, currently funded at $400 million, is set to expire unless Congress acts by the end of the month. From the moment a child is born, the learning begins. By the time kindergarten arrives, gaps have set in that can last a lifetime. In states red and blue, policymakers and advocates are increasingly looking to children’s earliest years to address the achievement gaps that have long plagued the U.S. education system. But as investment and enrollment in early childhood programs grow, access, quality, and cost all present problems. Thousands of charter school educators, leaders, and advocates gathered in Washington D.C. this week at a time of both great hope and palpable dissonance within the charter school sector. 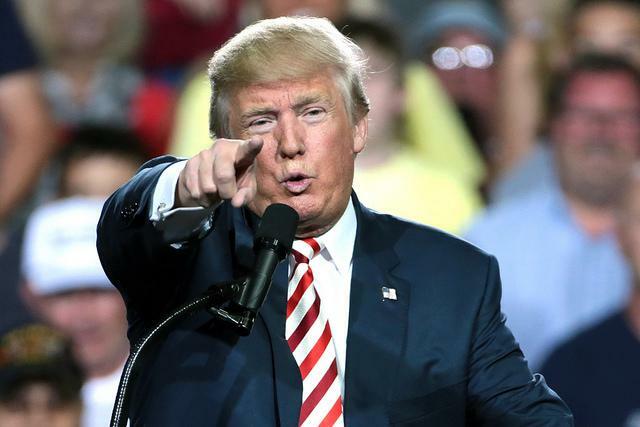 The tax code is complicated, the child-care system is fragmented, and President Donald Trump’s policy proposals can seem to change on a whim. And so, making sense of how tax reform can make child care more “accessible and affordable,” as Trump has vowed, is no simple task. The need to provide relief for families shouldering the high cost of child care has emerged as one of the few points of agreement between the White House and Democrats in Congress, but the two sides differ on just how to do that. Kavitha Cardoza of Education Week and the PBS NewsHour visited the early learning and daycare center at a Marine Corps base in North Carolina to find out why such programs are rated among the best in the country. 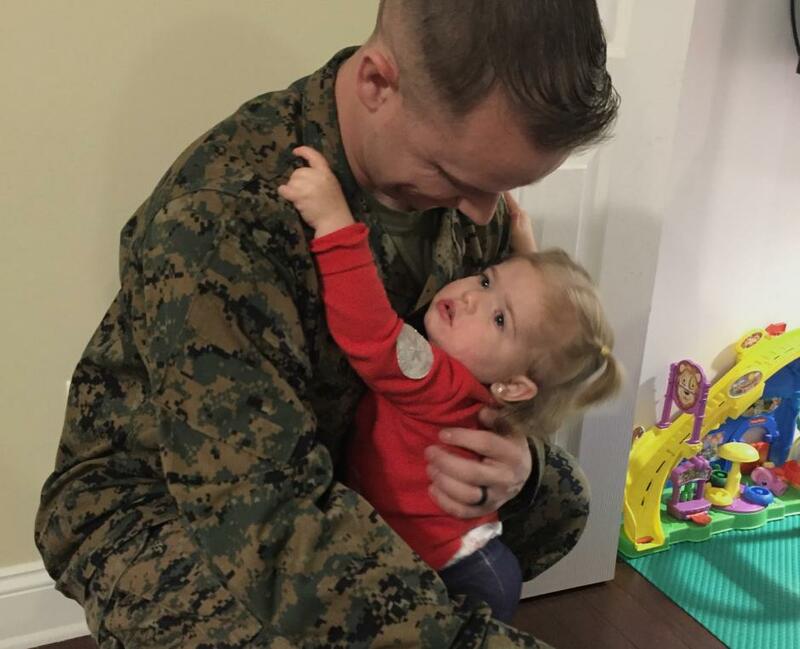 What spurred the Department of Defense to invest so heavily in teachers and support for the littlest learners? What evidence is there that these investments pay off in the long run? 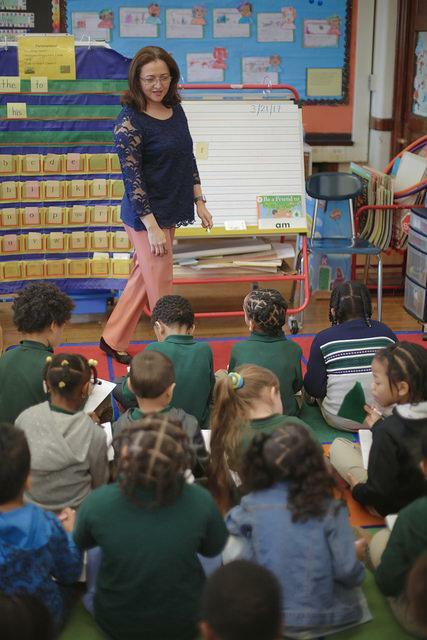 Latino students in kindergarten trail their white peers in math by approximately three months’ worth of learning, a new study by Child Trends Hispanic Institute has found. Researchers drew a nationally representative sample of students from the Early Childhood Longitudinal Study, Kindergarten Class of 2010-2011 who were followed through the end of their fifth-grade year. Sixty-two percent of the 2,199 Latino students studied had at least one foreign-born parent, and 45 percent spoke only Spanish or predominantly Spanish at home. Nearly half lived in poverty. 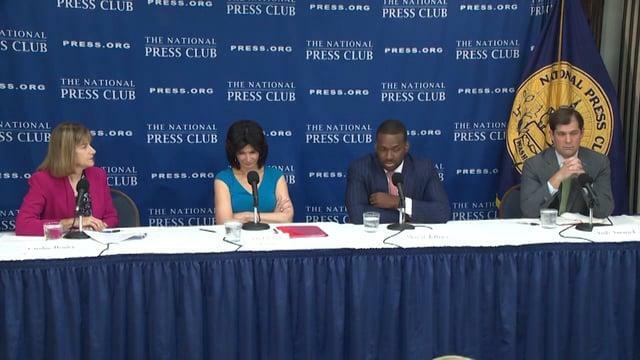 What’s Next for the White House Initiative on Educational Excellence for Hispanics? 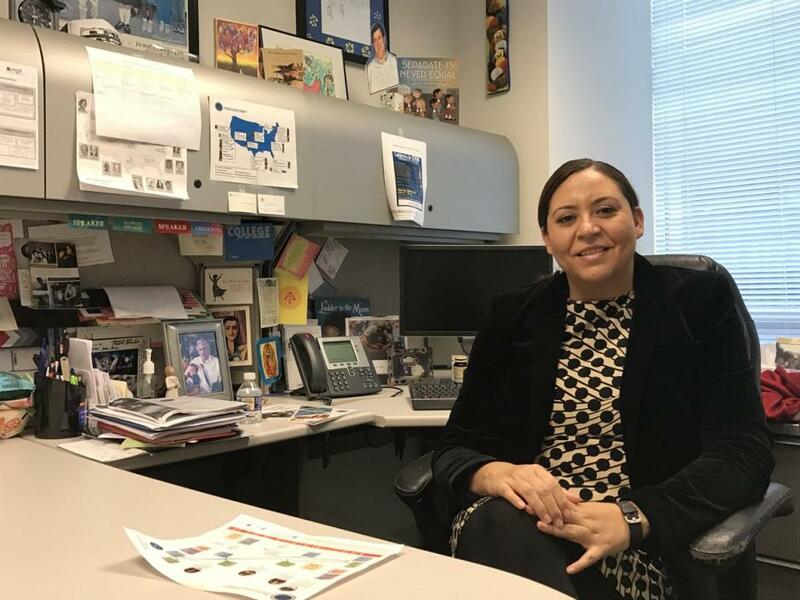 Alejandra Ceja has been the executive director of the White House Initiative on Educational Excellence for Hispanics since 2013 — a position she’ll give up at noon on Jan. 19, the day before the presidential inauguration. I recently sat down with her at the U.S. Department of Education to talk about the state of Latino education, the Initiative’s first 25 years, and what we can expect from the Initiative under the next administration. Editor’s note: This interview has been edited for length. More low-income Hispanic families are enrolling their children in early childhood care and education services, narrowing long-standing racial gaps in participation of these programs, new research shows. Numerous studies show large differences between economically advantaged and disadvantaged parents in the quality and quantity of their engagement in young children’s development. This “parenting gap” may account for a substantial portion of the gap in children’s early cognitive skills. However, researchers know little about whether the socioeconomic gap in parenting has increased over time. 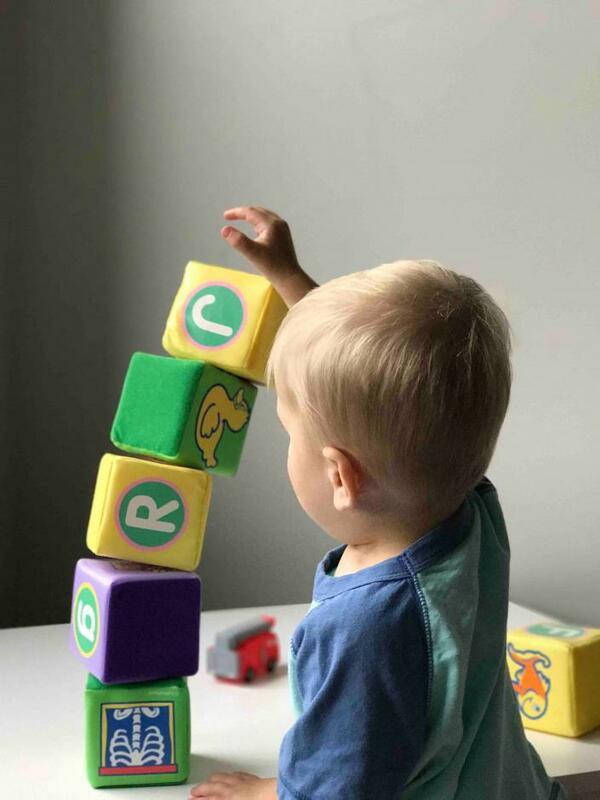 The present study investigates this question, focusing on income- (and education) based gaps in parents’ engagement in cognitively stimulating activities with preschool-aged children. 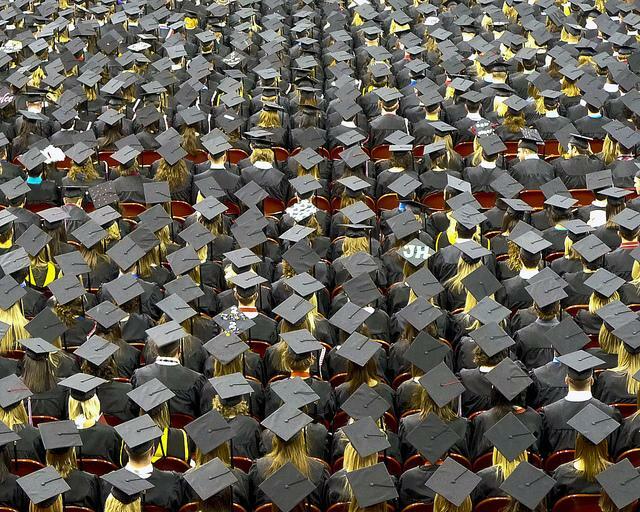 As federal education officials tout a fourth consecutive year of improvement in the nation’s high school graduation rate, the reactions that follow are likely to fall into one of three categories: policymakers claiming credit for the gains; critics arguing that achievement gaps are still far too wide to merit celebrating; and policy wonks warning against misuses of the data. 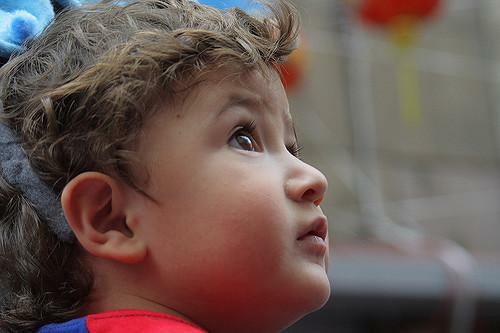 Is the U.S. Overlooking Its Littlest Learners? Who needs preschool? 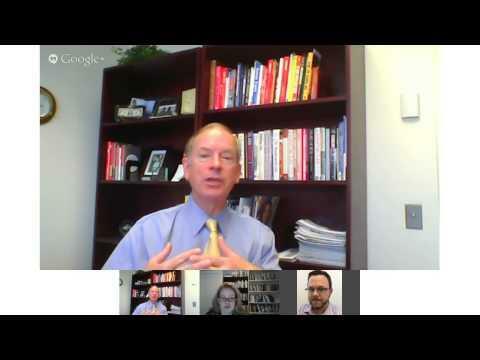 What do we know about the programs that produce the best long-term results? And why is America lagging so far behind many countries in providing high-quality, affordable programs to young learners? In a six-part series for The Hechinger Report, Lillian Mongeau examines the latest research, visits classrooms in the U.S. and abroad, and looks at efforts to raise the bar for certification and training for early childhood educators. She talks with EWA public editor Emily Richmond about what she learned in places like Boston and England, and offers smart story ideas for reporters in their own communities. Today’s assignment: Reporting on the nation’s largest school district, with 1.1 million students and an operating budget of $25 billion. Patrick Wall of Chalkbeat New York has dug deep into the city’s special education programs, investigated whether school choice programs are contributing to student segregation rather than reducing it, and penned a three-part series on on one high school’s effort to reinvent itself. He talks with EWA public editor Emily Richmond about his work, and offers tips for making the most of student interviews, getting access to campuses, and balancing bigger investigations with daily coverage. A first-prize winner for beat reporting in this year’s EWA Awards, Wall is spending the current academic year at Columbia University’s School of Journalism as a Spencer Fellow. Margarita is a four-year-old girl living in East Harlem. She speaks Spanish at home with her Mexican-born parents, is obedient, well-behaved and plays well with kids her age, younger and older. 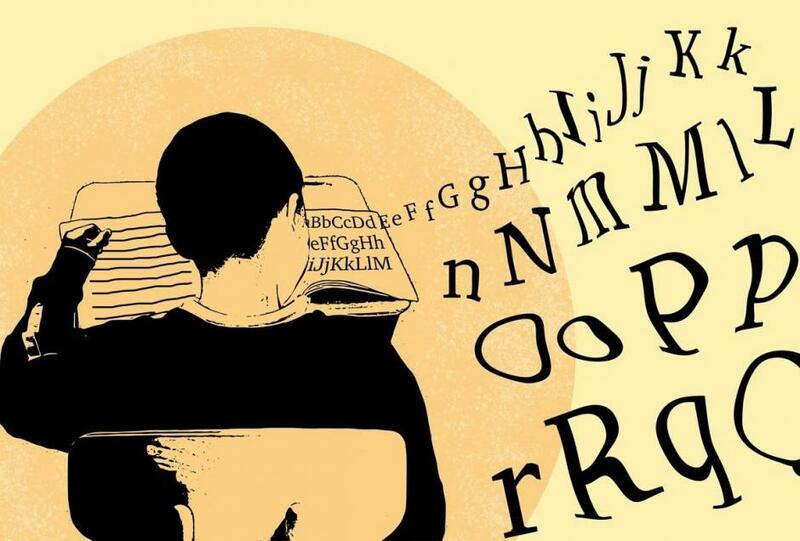 Young Latinos who are not proficient in English are more likely to develop higher early literacy skills when their teachers are also Latino, according to a University of Virginia study released this week examining the teacher-student racial gap in pre-K. When it comes making prekindergarten available to all children, the question for policymakers is not whether it’s a good idea or not. The issue is whether it’s possible to make high-quality pre-K universal, and what makes pre-K effective in the first place. 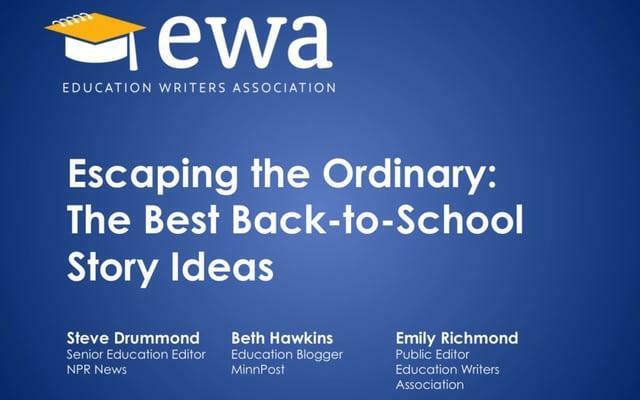 That was the main message from experts who spoke earlier this month at the Education Writers Association’s national seminar in Boston. Nearly 400,000 Latino infants and toddlers went uncounted during the last U.S. census — a figure that could have implications on their future education, according to a new report. Professor Heckman’s comprehensive new study, Early Childhood Education, addresses two important issues in the debate over early childhood education programs: are they effective and should they be subsidized by the government. Heckman and co-authors Sneha Elango, Jorge Luis García and Andrés Hojman, find that disadvantaged children benefit the most from a variety of early childhood interventions and society receives a higher return from targeted investments. As a result, policy makers would be wise to use means-testing rather than universal subsidies for all children. Want to know what your child should be learning in kindergarten? Hunting for a list of age-appropriate books? 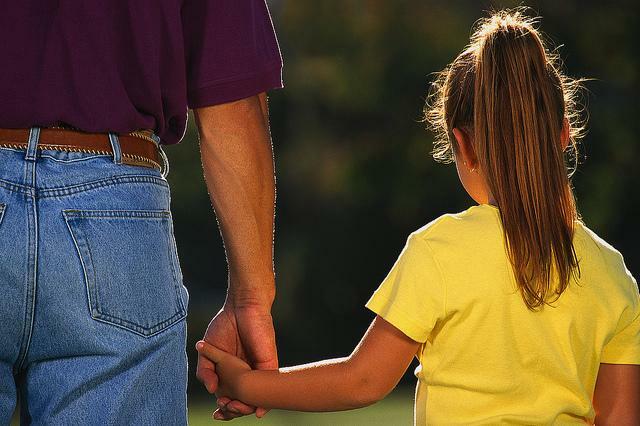 Afraid your daughter is being bullied but don’t know how to ask? 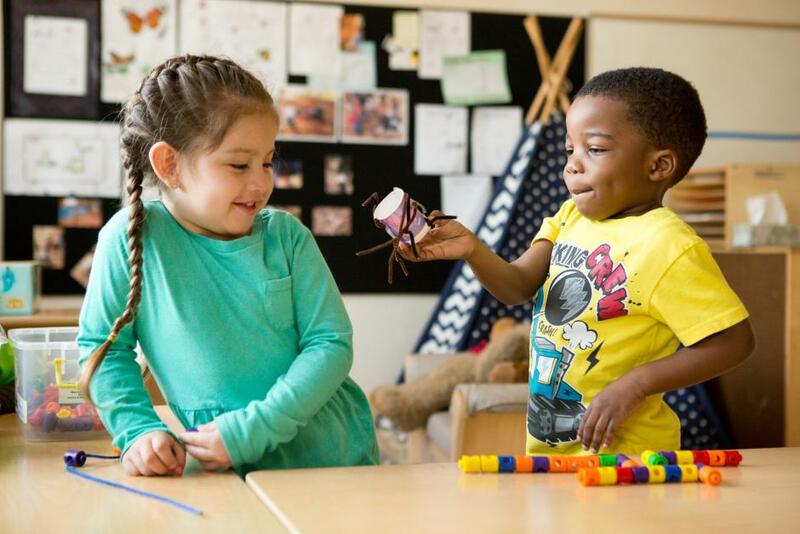 The preschool-to-third grade perspective has helped the early childhood field move away from a reliance on relatively brief or one-shot programs toward more systematic and comprehensive models that span most of children’s first decade. We review the knowledge base on the effectiveness of preschool-to-third grade intervention programs and practices for young children making the transition to school. Latino children enter kindergarten with socioemotional skills that are on par and sometimes even better than their non-Latino peers’ abilities. This means they’re on track in their capability to make friends and behave in school. But Latinos also have a greater probability of arriving to their first day of classes behind their peers academically. President Barack Obama has made it a goal to produce more college graduates than any other nation in the world. 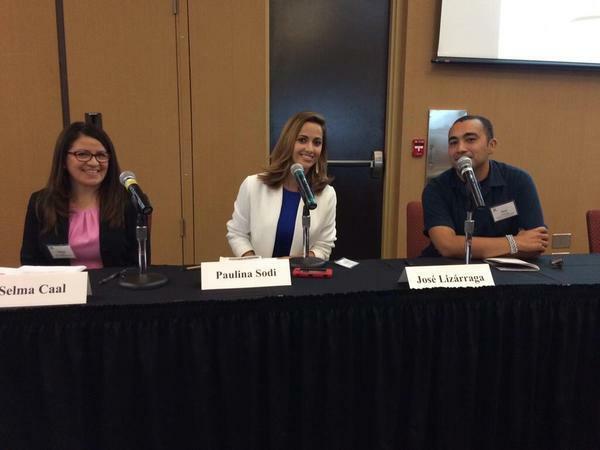 In the opening session of the Education Writers Association’s second annual Spanish-Language Media Convening, Modesto Abety-Gutierrez presented a picture of the Latino student population in the United States. 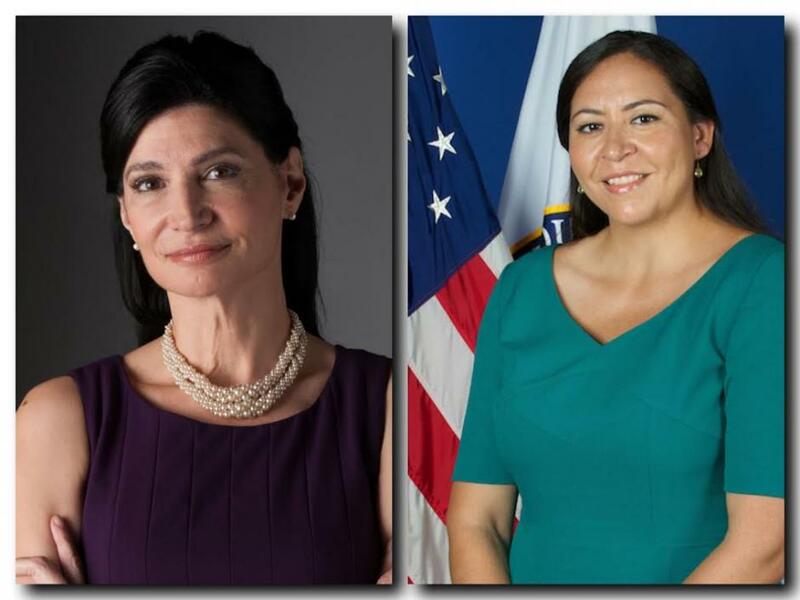 Abety-Gutierrez is a member of the President’s Advisory Commission on Educational Excellence for Hispanics. 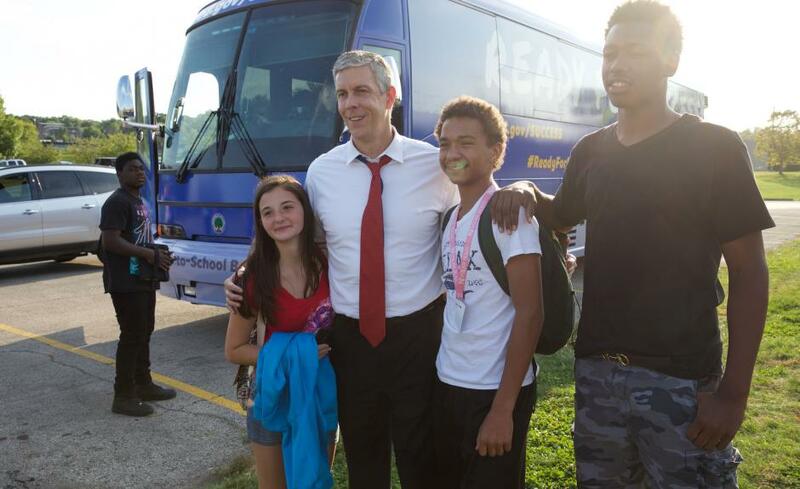 U.S. Secretary of Education Arne Duncan is on the road this week for his sixth annual back-to-school bus tour. 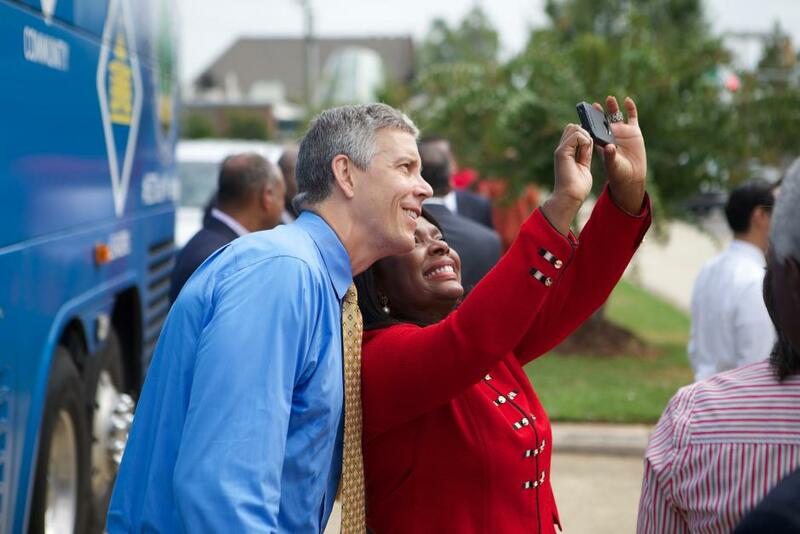 U.S. Secretary of Education Arne Duncan launches his sixth annual back-to-school bus tour this week, and the chosen locations offer some insights into the department’s priorities in the waning days of the Obama administration. 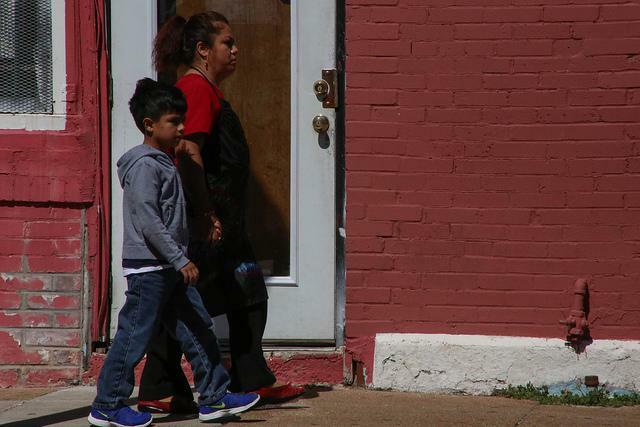 Fewer options for preschool, inexperienced teachers and low-performing schools are just some of the disadvantages children of immigrants face early in their education, a new Migration Policy Institute report points out. While too many students at all grade levels are regularly skipping school, many preschoolers and kindergarteners are missing nearly as much seat time as teenagers, according to a new report. The lost learning time, particularly in the younger grades, translates into weaker math and reading skills that become long-term deficits for students even years down the road, according to the new report from Attendance Works, a national advocacy organization, and the nonprofit Healthy Schools Campaign. The 2015 factsheets for each of the 50 states and the District of Columbia provide information for early childhood professionals and policymakers about the status of infants, toddlers, and families in their state. The State Baby Facts present infant and toddler data in the framework of good health, strong families, and positive early learning experiences. With engaged parents, bright futures are possible. That’s the philosophy of a child care center on Chicago’s South Side that is pairing research-based child development techniques with a strong family partnership. The Educare Center grew from a program that had been based at the notorious Robert Taylor Homes. Educare opened their own facility in 2000 as the public housing high-rises across the street were being dismantled. Preschool advocates have had a tough time convincing lawmakers that spending money in the earliest years of a child’s education has a long-term payoff. Just ask Illinois First Lady Diana Rauner. At this year’s Education Writers Association conference in Chicago, Rauner said her husband, Republican Gov. 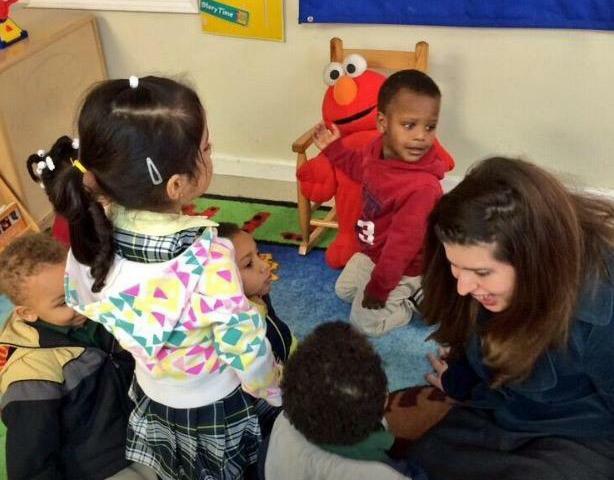 Bruce Rauner, understands the value of early childhood education. Fathers often get a bad rap, especially the dads and guardians who occupy the lower rungs of the economic ladder. 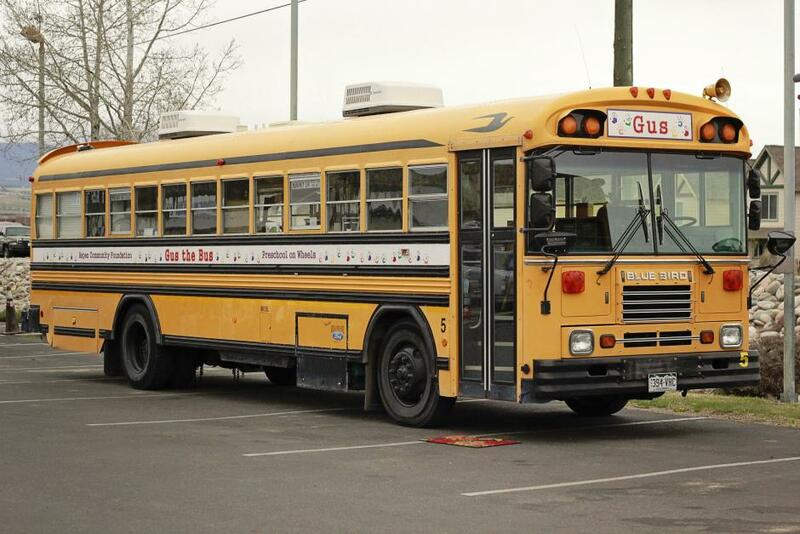 Two used buses retrofitted into state-of-the-art preschool classrooms drive around several of Colorado’s most rural and isolated communities to bring high-quality preschool right to families’ doorsteps. Saturday nights in the newsroom we keep an ear tuned to the scanner. After dark it becomes this portal to all nightmares, a listening post to a relationship war zone. At first, calls of beatings, knifings and guns drawn ramp up the adrenalin. But eventually, the drone of the dispatchers and pure repetition dull the impact. About 40 percent of all cases at the District Attorney’s office in my county relate to domestic violence. The U.S. Department of Education released a new report outlining the unmet need for high-quality early learning programs in America. Roughly 6 in 10 four-year-olds are not enrolled in publicly funded preschool programs, and even fewer are enrolled in the highest quality programs. When comparing 9-month-old babies of various ethnicities, a new study finds there aren’t many differences in infants’ abilities to recognize words and gestures or manipulate objects. By age 2, however, gaps start to emerge. Chicago Public Schools has announced the debut of a new interdisciplinary Latino and Latin American Studies curriculum that will be taught to students in kindergarten through 10th grade. 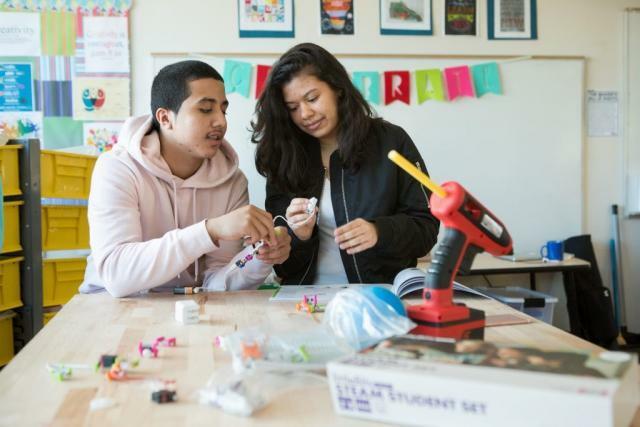 The new curriculum includes complete units and lessons across a range of disciplines, Melissa Sanchez reports for Catalyst Chicago. Massachusetts regularly scores at or near the top of national comparisons when it comes to its public schools, and the newest report from the Education Week Research Center is no exception – in overall education indicators it receives a B, the highest letter grade among the states. However, the Bay State isn’t faring as well with early childhood education. “Preparing to Launch: Early Childhood’s Academic Countdown” gives the Bay State a “C-” for its programs serving the littlest learners. Experts often find it difficult to separate the two, because the success of so many children depends on their health, Suzanne Gamboa writes. Just like journalists need to know the important questions to ask on the education beat, parents do, too. That’s the spirit behind a joint initiative by The Dallas Morning News, Al Día — it’s Spanish publication — and Southern Methodist University to get Hispanic parents involved in their children’s education. Children are “Too Small To Fail” — the name of one organization that’s teamed up to focus on improving early learning results among Hispanic children. As millions of immigrants waited for President Barack Obama to shed light on their future Thursday, educators, too, had a stake in the conversation. ‘My Brother’s Keeper’: Is It Working? 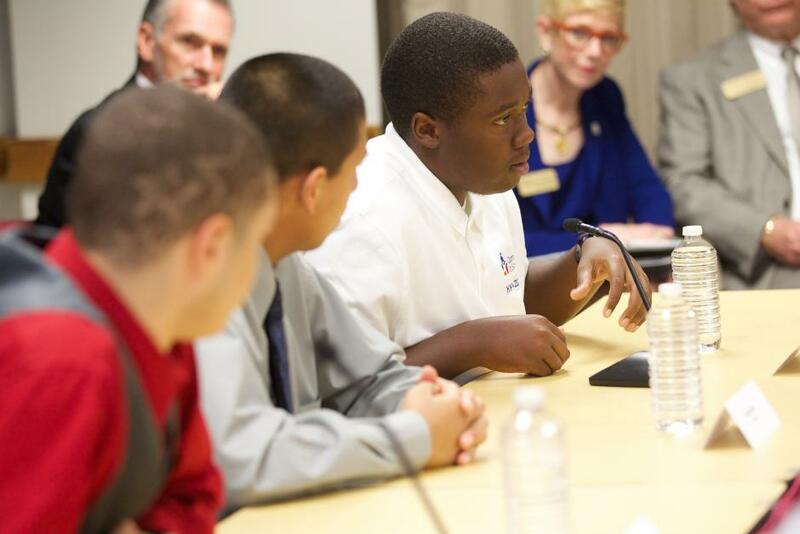 The goal is simple: create a “cradle-to-college-and-career strategy” to lessen the achievement gap among boys of color. But implementing My Brother’s Keeper – a White House initiative rolled out in February — may be more complex than it sounds. 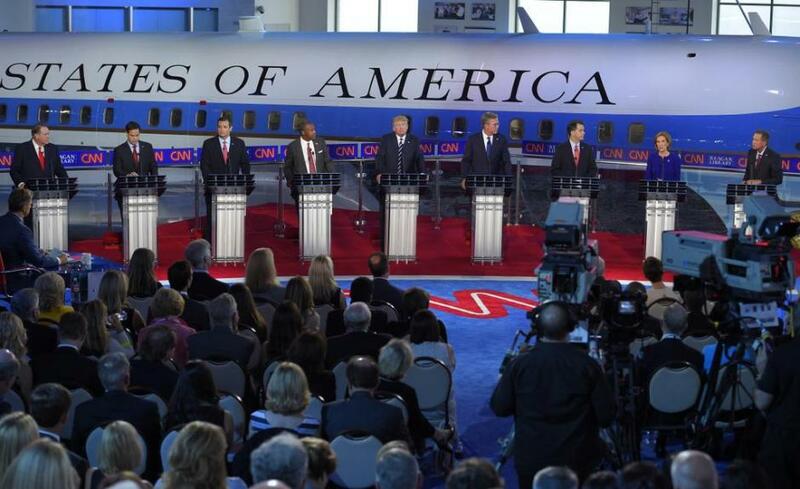 Are Students Learning Lessons of Midterm Elections? 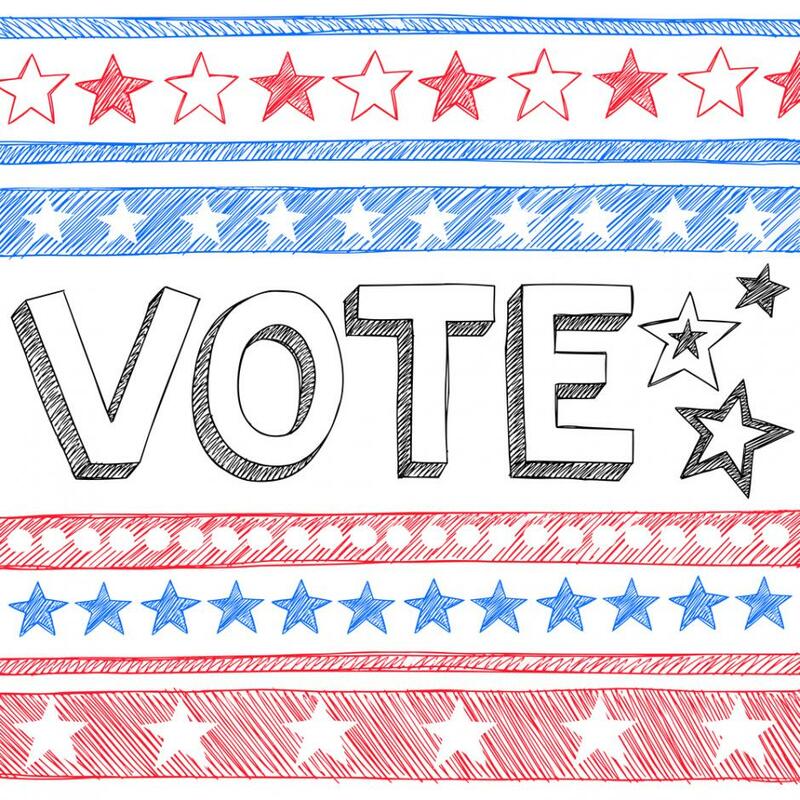 Today is a day off from school for millions of students as campuses in some districts and states — including Michigan and New York — are converted into polling stations for the midterm elections. 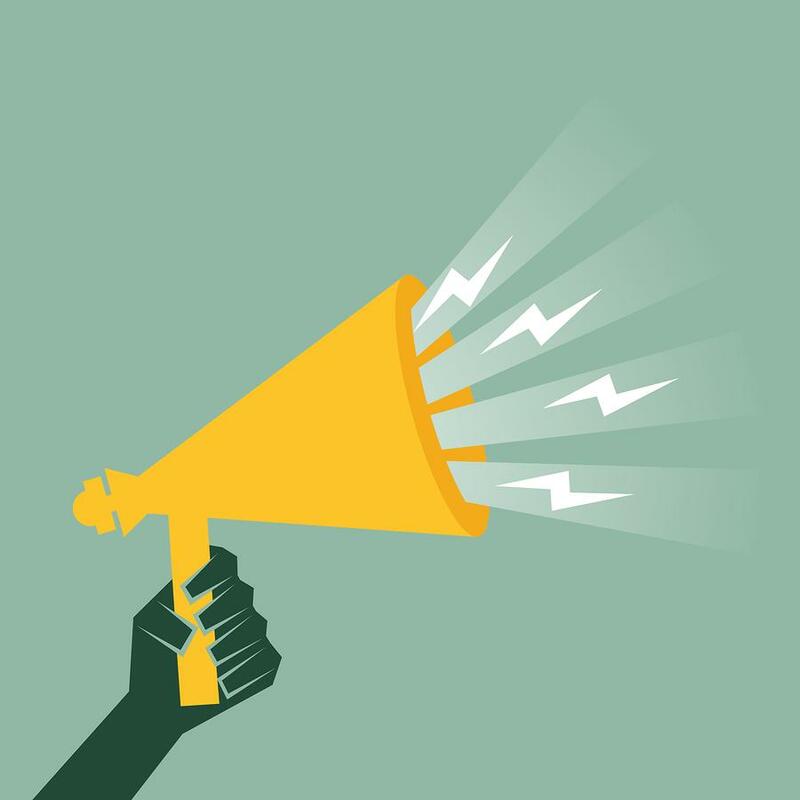 To Peter Levine, the director of the Center for Information and Research on Civic Learning and Engagement, that’s a missed opportunity to demonstrate democracy in action. Latino children have a lot going for them. 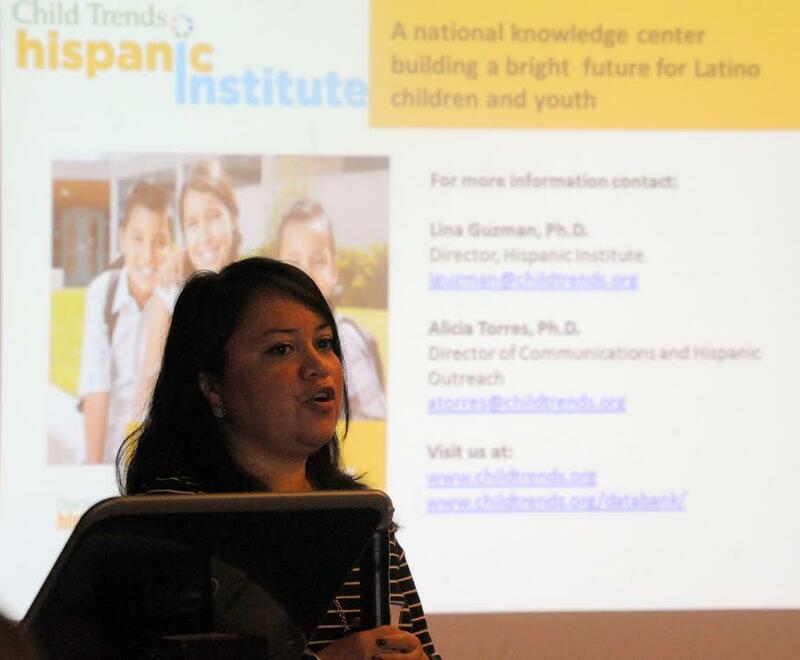 That’s according to Lina Guzman, director of Child Trends Hispanic Institute, who presented at last week’s EWA Spanish-Language Media Convening in Dallas during our “What the Research Says” session. Early education gets support from both sides of the aisle. The U.S. Chamber of Commerce runs campaigns advocating for it. So does Hillary Clinton. And research appears conclusive that it’s important. But as states respond to the data, a new challenge emerges: implementing early education programs successfully. Several recent stories provide different looks at how some locales are scaling up their early education offerings. The Edward C. Mazique Parent Child Center has been a backdrop for political news conferences and a destination for foreign dignitaries. 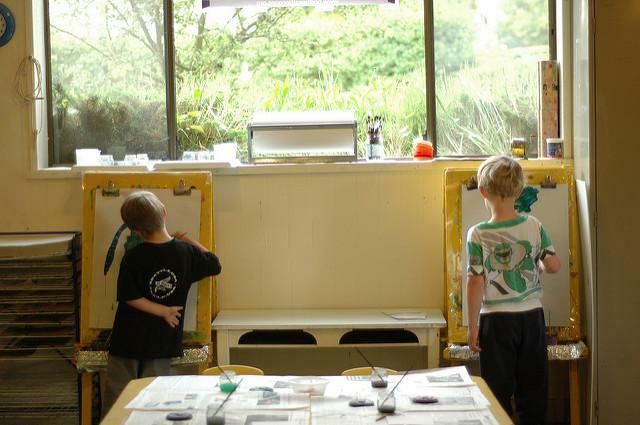 Now it’s among the first in the Washington region to lose its Head Start grant. Head Start, which costs about $8 billion a year and serves a million children and families nationwide, has been under pressure to improve quality amid reports of fiscal mismanagement and questionable academic outcomes. 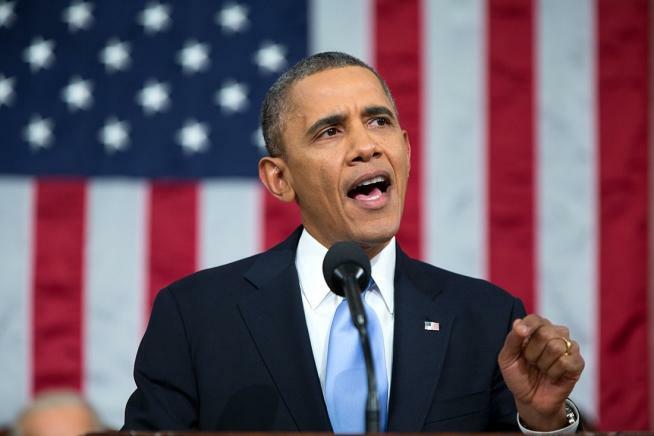 From President Barack Obama’s 2013 call to expand preschool in his State of the Union Address to a series of statewide pushes for better-funded early childhood education programs, all eyes are turning toward our nation’s youngest learners. Journalists hoping to tap into the world of early childhood education reporting will have no shortage of angles and story ideas to tackle. The report, commissioned by Sesame Street Workshop and written by Mathematica Policy Research, shows wide differences in school readiness persist with 44% of children entering school with one or more risk factors that impact their success in school. The analysis examined four risk factors that have been associated with children’s development and school achievement: single parent households, mothers with less than a high school education, households with incomes below the federal poverty line and non-English speaking households. The summer slide doesn’t just pertain to flagging academic skills while kids soak in the sun and skip the books. 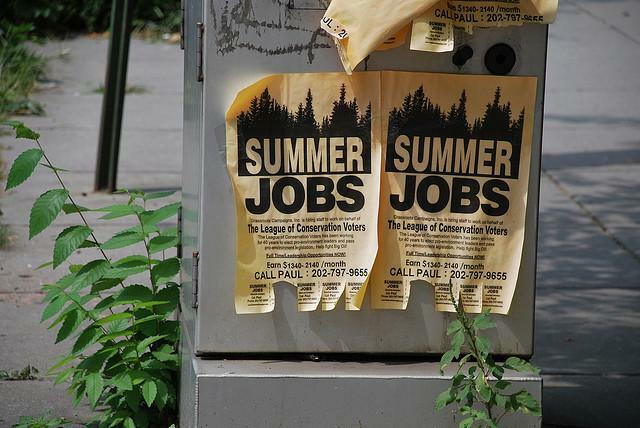 Increasingly, even as math and literacy fall by the wayside, high school students are losing out on access to summer wages. A new poll from PACE/USC Rossier School of Education suggests California voters are losing enthusiasm for the Common Core State Standards. A new evaluation of the effectiveness of the Abriendo Puertas parenting program in the Los Angeles Unified School District found some positive results. Defending the Early Years (DEY) seeks to rally educators to take action on policies that affect the education of young children. The project seeks to mobilize the early childhood education community to speak out against what it considers inappropriate standards, assessments, and classroom practices. 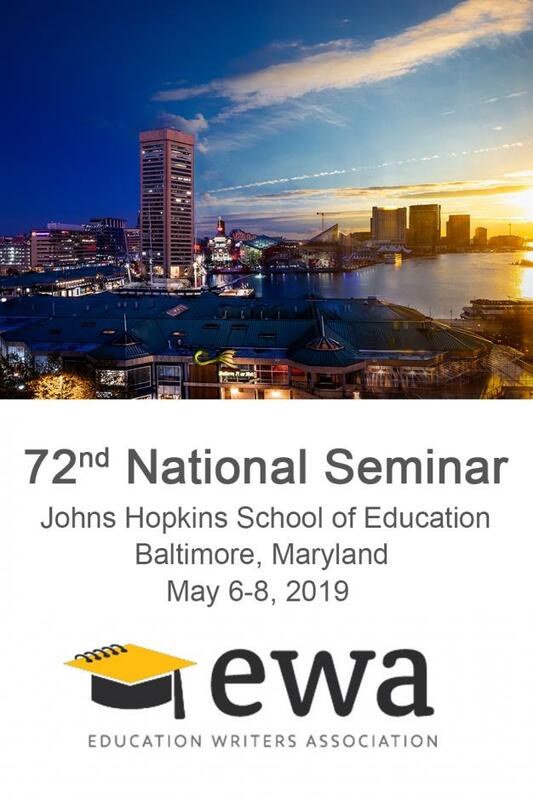 Today’s post features guest blogger Mandy Zatynski of The Education Trust, who attended EWA’s National Seminar at Vanderbilt University in Nashville earlier this month. Thanks to the prevalence of blogs and other communication platforms, education writing now reaches beyond daily journalism and includes advocates, researchers, and almost anyone who has an interest in education and the desire to opine. But that doesn’t mean all of it is good. Twenty-eight percent of America’s 4-year-olds were enrolled in a state-funded preschool program in the 2012-2013 school year, the same percentage as the year before. The actual number of children enrolled decreased, including 9,000 fewer 4-year-olds served in these programs. The findings in this Yearbook raise serious concerns on the quality and availability of pre-K education for most of American young learners. A Latino civil rights organization has filed a lawsuit against the state of New Mexico, alleging that its public school system is denying students from low-income backgrounds and English language learners access to a quality education. 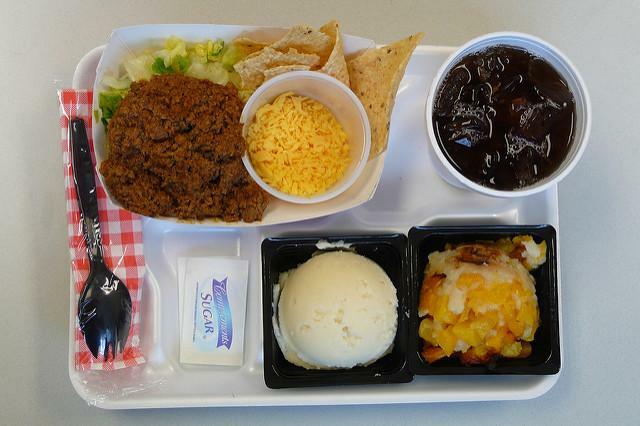 The Mexican American Legal Defense and Educational Fund filed suit on Tuesday, on behalf of parents from around the state and their school-aged children. A new index created by the Annie E. Casey Foundation measures child well-being broken out by race and ethnicity nationally and at the state level. 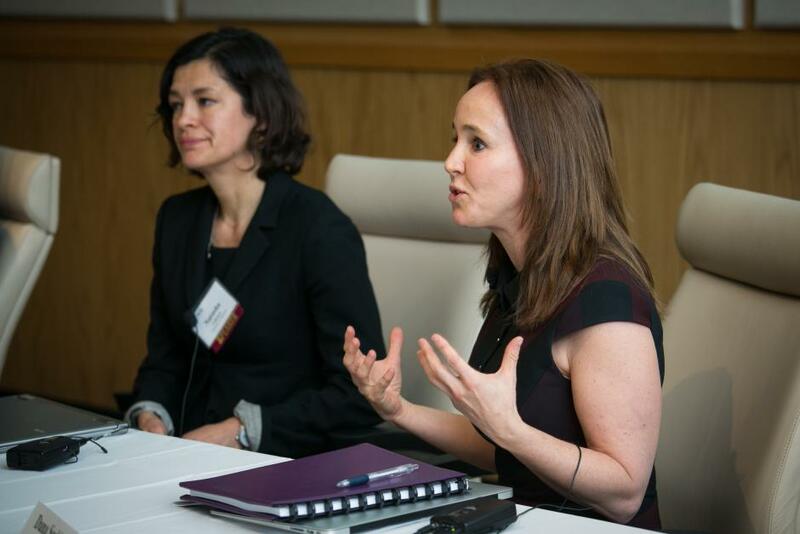 Dana Suskind of Thirty Million Words discusses the childhood language gap and approaches to closing it; Natasha Cabrera of the University of Maryland talks about the assets minority children bring to preschool; and Tim Bartik of the Upjohn Institute for Employment Research talks about the economics of early childhood education. In half of the 50 states plus the District of Columbia, students must turn age 5 by the end of September to attend kindergarten. Nineteen states requires students to turn age 5 on or before Sept. 1. Fifteen states plus D.C. require children to attend kindergarten at age five or require kindergarten attendance prior to enrolling in first grade. Thirty-five states do not require kindergarten attendance. Veteran education reporter Sarah Carr offers advice and strategies for journalists on the challenges of covering early childhood. Read "The Hell of American Daycare"
Is Federal Early Childhood Policy Headed in the Right Direction? 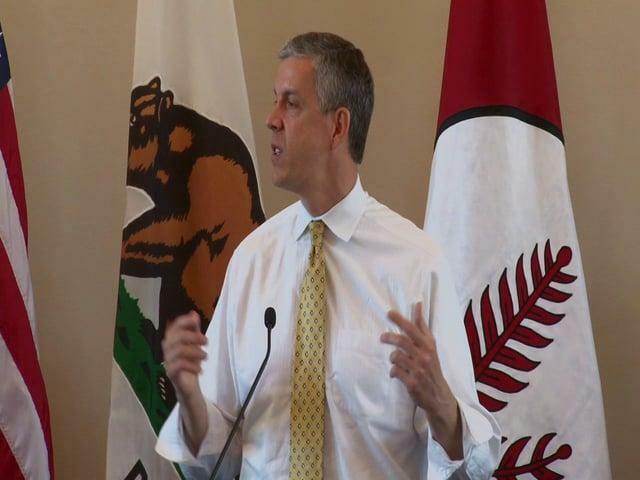 What has the Obama administration achieved in the area of early childhood education? 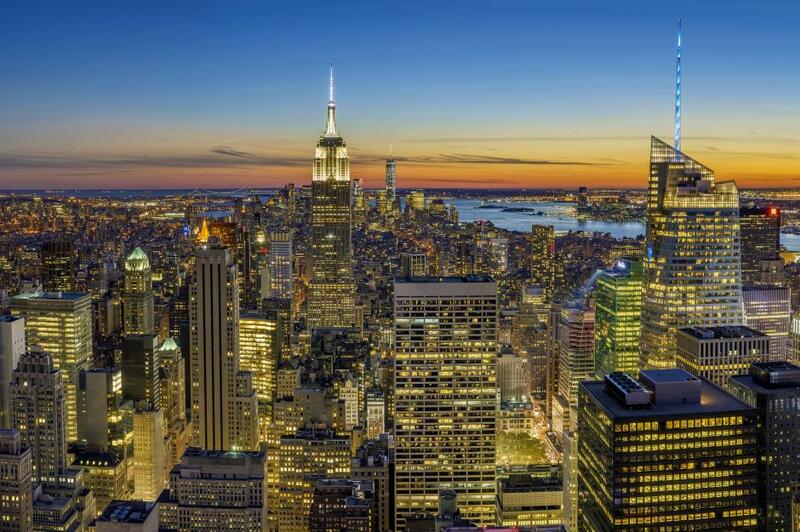 What are the pros, cons and prospects for its current agenda? And how is that agenda playing out in the broader policy landscape, federal and otherwise? A discussion between Libby Doggett, U.S. Department of Education, and Russ Whitehurst of the Brookings Institution, moderated by NPR’s Claudio Sanchez. 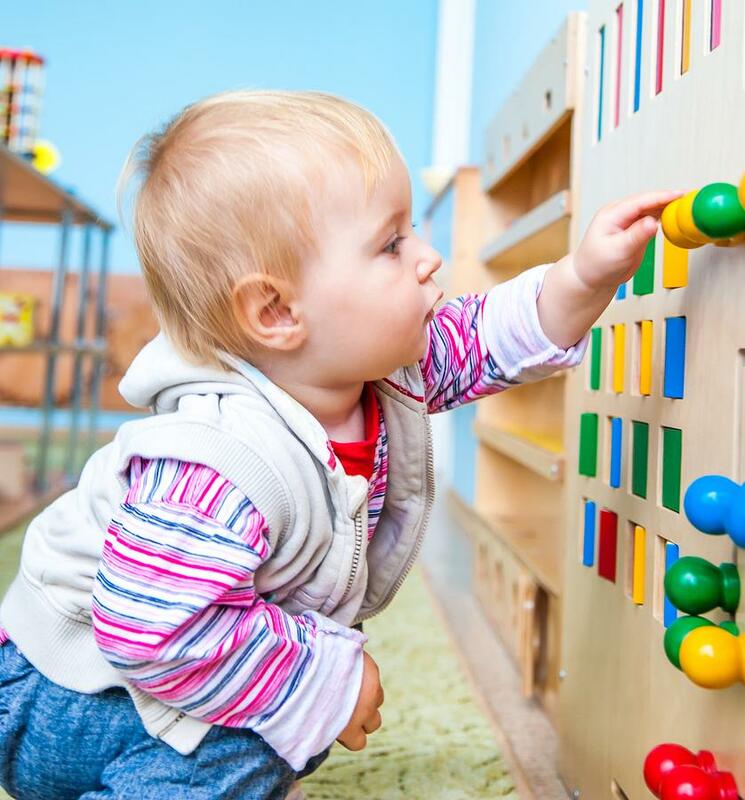 Early Childhood Education: Does the Research Justify the Cost? EWA recently hosted a seminar in New Orleans on early childhood education. We asked some of the journalists who attended to contribute posts from the sessions. Today’s guest blogger is Alexander Russo of Scholastic’s This Week in Education. 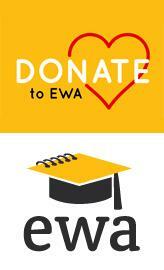 You can also find out more about early childhood education on EWA’s Topics page. EWA recently hosted a seminar in New Orleans on early childhood education. We asked some of the journalists who attended to contribute posts from the sessions. 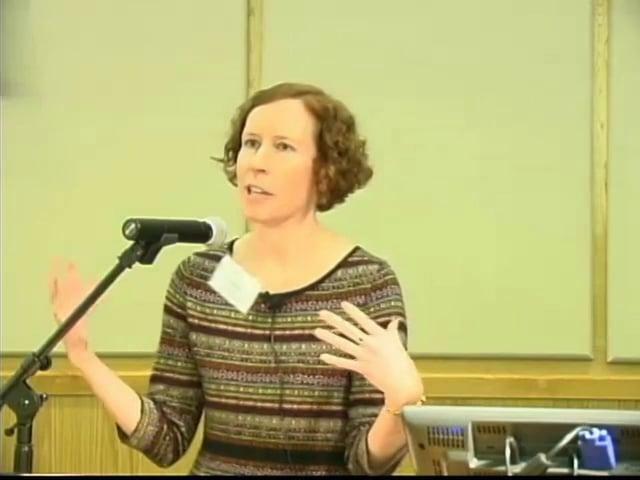 Today’s guest blogger is Elle Moxley of StateImpact Indiana. You can also find out more about early childhood education on EWA’s Topics page. EWA recently hosted a seminar in New Orleans on early childhood education. We asked some of the journalists who attended to contribute posts from the sessions. Today’s guest blogger is Leslie Brody of The Record in New Jersey. You can also find out more about early childhood education on EWA’s Topics page. In the face of the enormous challenge of boosting public funds for preschool, advocates of early childhood education are getting creative. EWA recently hosted a seminar in New Orleans on early childhood education. We asked some of the journalists who attended to contribute posts from the sessions. Today’s guest blogger is Ann Dornfeld of Puget Sound Public Radio. You can also find out more about early childhood education on EWA’s Topics page. 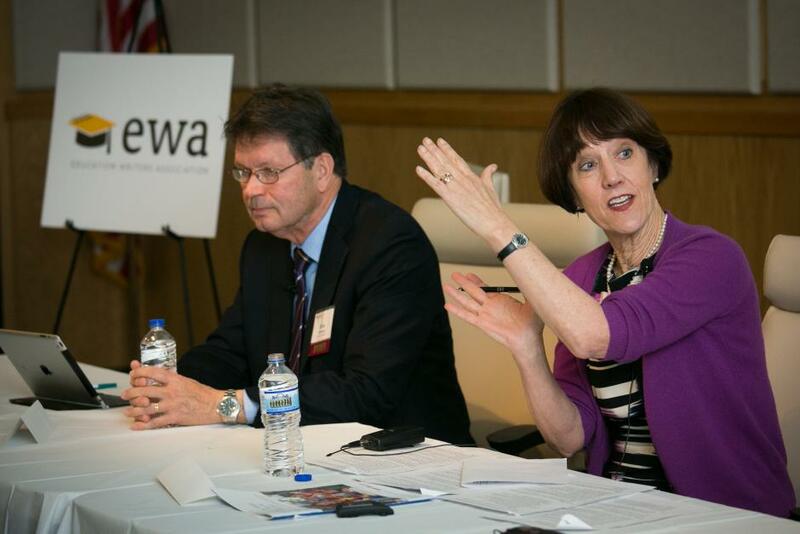 Earlier this month EWA hosted a seminar in New Orleans on early childhood education. We’ll be sharing video and podcasts from the event in the coming weeks. We also asked some of the journalists who attended to contribute posts from the sessions. Today’s guest blogger is Joy Resmovits of the Huffington Post. You can also find out more about early childhood education on EWA’s Topics page. 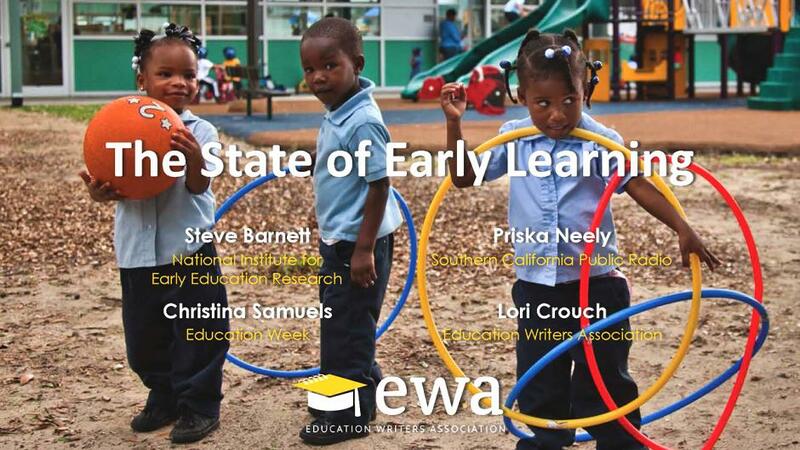 Earlier this month EWA hosted a seminar in New Orleans on early childhood education. We’ll be sharing video and podcasts from the event in the coming weeks. We also asked some of the journalists who attended to contribute posts from the sessions. Today’s guest blogger is Adrienne Lu of the Pew Charitable Trusts. You can also find out more about early childhood education on EWA’s Topics page. Earlier this month EWA hosted a seminar in New Orleans on early childhood education. We’ll be sharing video and podcasts from the event in the coming weeks. We also asked some of the journalists who attended to contribute posts from the sessions. 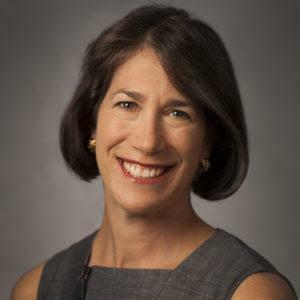 Today’s guest blogger is Stacy Teicher Khadaroo of the Christian Science Monitor. You can also find out more about early childhood education on EWA’s Topics page. 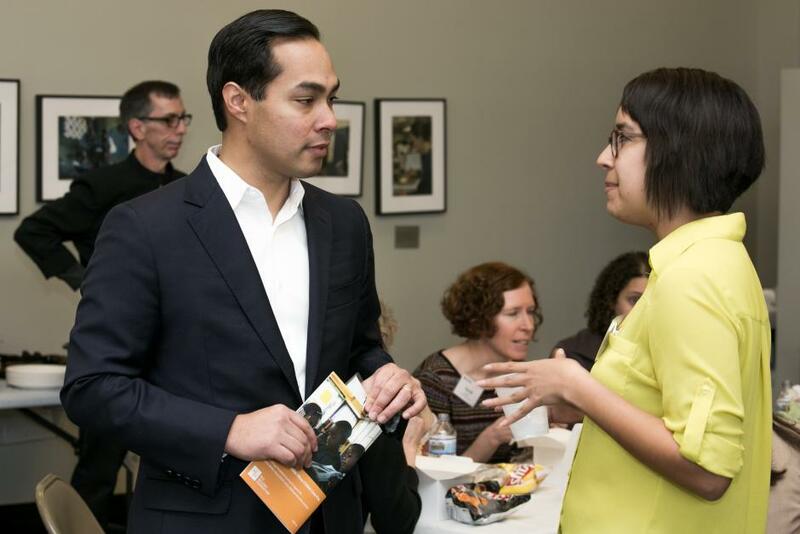 A few years ago, San Antonio Mayor Julián Castro – the Democratic Party’s first Hispanic keynote convention speaker – decided his city needed to expand its preschool opportunities for young children. To pay for it, Castro built a coalition of public-private partnerships and bipartisan support and convinced voters in 2012 to approve a new tax that would fund expanded preschool opportunities throughout the city. 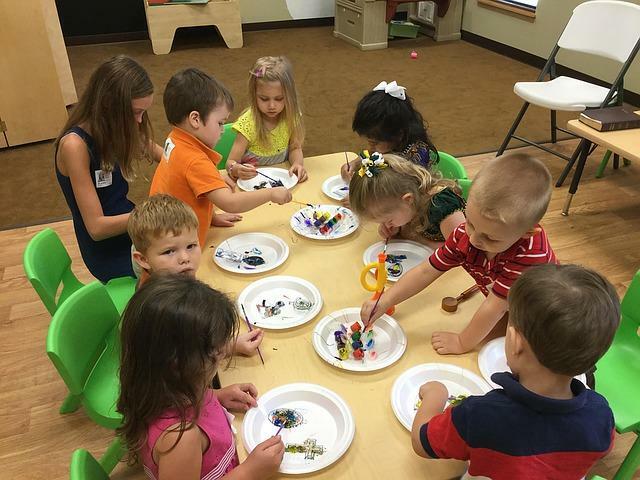 Known as “Pre-K 4 San Antonio,” the program launched in the fall and is expected to expand in the coming years. 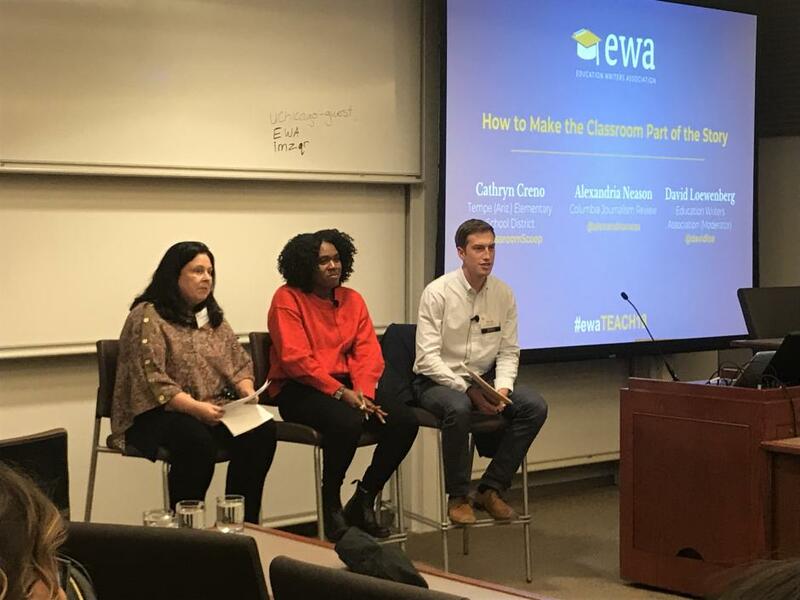 Castro was the keynote speaker at EWA’s recent seminar for journalists on early childhood education, held at Tulane University in New Orleans. More than 40 reporters from across the country spent two days at Tulane University in New Orleans for EWA’s seminar on early childhood education. The focus was on the latest research on brain development, and how states and municipalities are struggling to add more preschool opportunities. Hillary Clinton and Spanish-language television network Univision are launching a new initiative geared at encouraging Latino parents to help their preschool-aged children develop reading and language skills. Clinton announced the campaign in an appearance in a classroom in New York City. The effort involves Clinton’s Too Small to Fail campaign founded by the Bill, Hillary and Chelsea Clinton Foundation and the nonprofit group Next Generation. It will be known as “Pequeños y Valiosos,” or young and valuable. 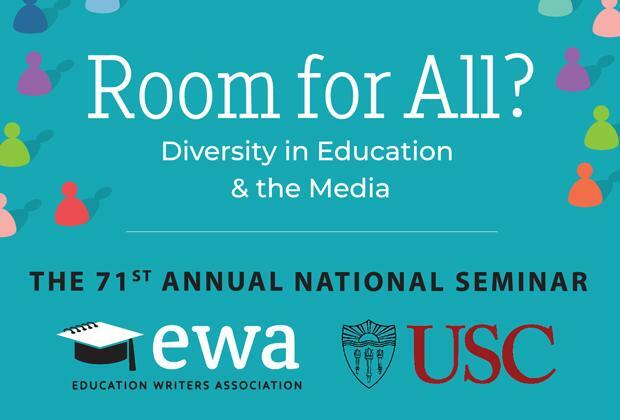 Join EWA and your fellow journalists Feb. 3-4 at our first seminar in 17 years to focus solely on covering early childhood education. 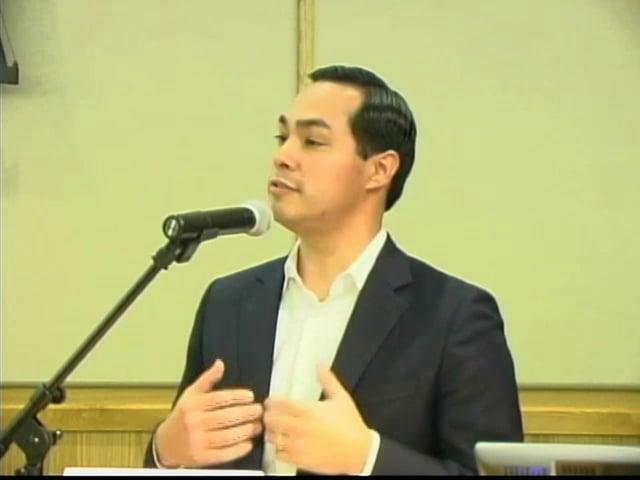 San Antonio Mayor Julián Castro delivers the keynote address at EWA’s seminar on early childhood education in New Orleans. Lillian Mongeau is one of the few reporters whose whole beat is early childhood education. She offers advice on how to cover the topic effectively. 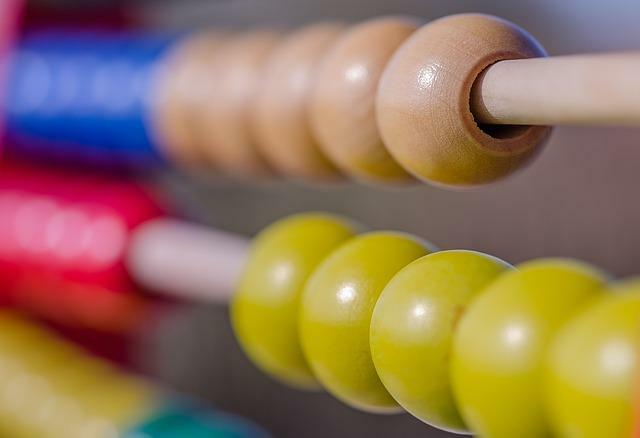 Despite the years of conversation about expanded preschool being the key to closing achievement gaps, a new report says that federal funding for children ages zero to eight is not increasing. In fact, it is trending slightly downward. 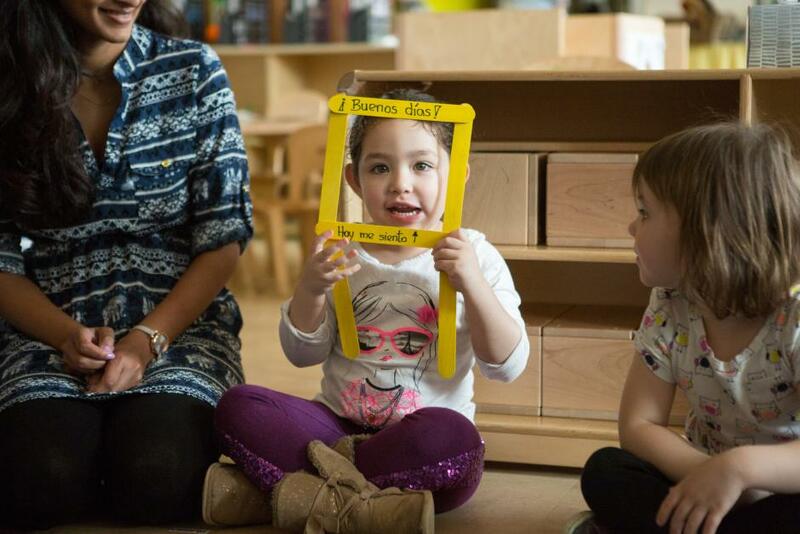 Early education is a critical issue for Latinos. They are less likely to attend preschool than black or Hispanic children. In episode 3 of EWA Radio, Michele McNeil and Alyson Klein of Education Week’s Politics K-12 blog stop by for some post-State of the Union analysis. This KIDS COUNT data snapshot finds 80 percent of fourth-graders from low-income families and 66 percent of all fourth-graders are not reading at grade level. While improvements have been made in the past decade, reading proficiency levels remain low. 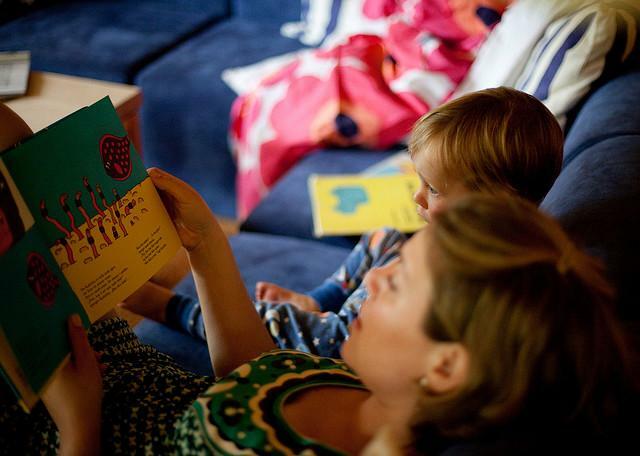 Given the critical nature of reading to children’s individual achievement and the nation’s future economic success, the Casey Foundation offers recommendations for communities and policymakers to support early reading. Early reading proficiency rates for the nation and each state are provided. The annual State of the Union address to Congress – and the nation – is President Obama’s opportunity to outline his administration’s goals for the coming months, but it’s also an opportunity to look back at the education priorities outlined in last year’s address – and what progress, if any, has been made on them. 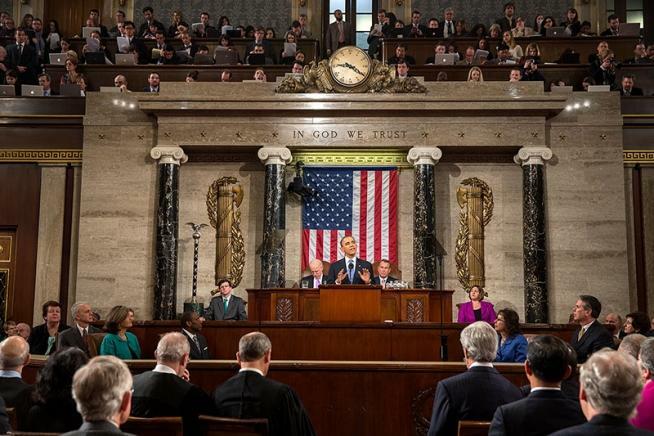 Among the big buzzwords in the 2013 State of the Union: college affordability, universal access to early childhood education, and workforce development. Story ideas on early education your editors and readers will love. Across Virginia, about $23 million designated for preschool was left on the table because localities — citing limited resources, lack of classroom space and politics — did not contribute the required matching funds to take full advantage of the program. As a result, more than 6,000 disadvantaged children missed the opportunity to go to school before kindergarten. 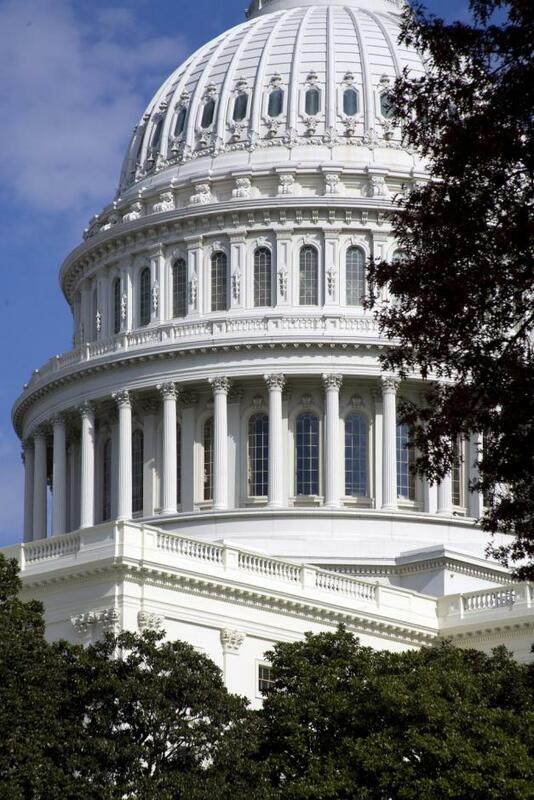 A new federal spending bill was introduced by Congressional leaders from both sides of the aisle, and it would provide $1 billion in new money for Head Start programs and restore much of the forced budget cuts of last year’s sequestration. The “Nation’s Report Card” is out today for fourth and eighth graders in reading and math, and while there are some positive trends over the past two decades, a significant achievement gap persists among minorities and for America’s students when compared with their peers internationally. 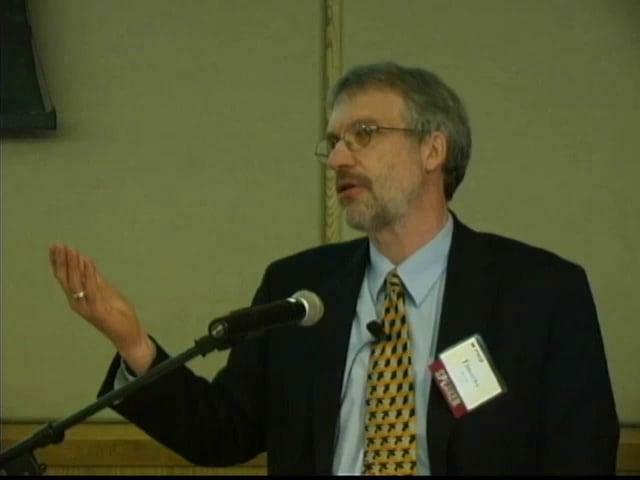 Robert Pianta describes his extensive research into what makes a good early childhood education teacher and how the University of Virginia developed an instrument to measure early childhood teachers. 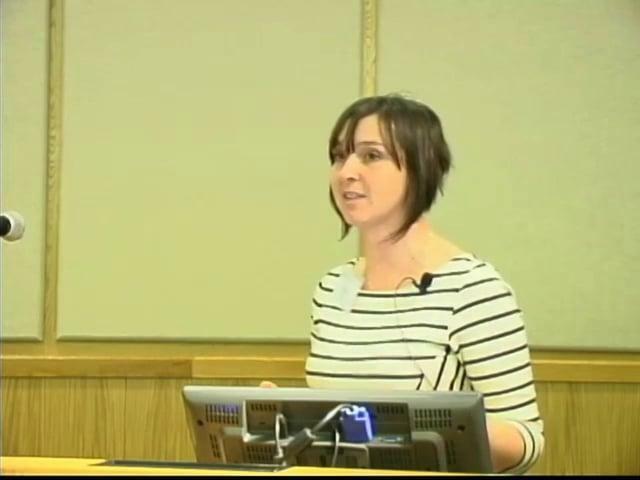 Laura Bornfreund discusses the different approaches being used by districts to measure student growth for the purpose of evaluating early childhood education (Pre-K-grade 3) teachers as well as the potential hurdles to widespread, reliable implementation. 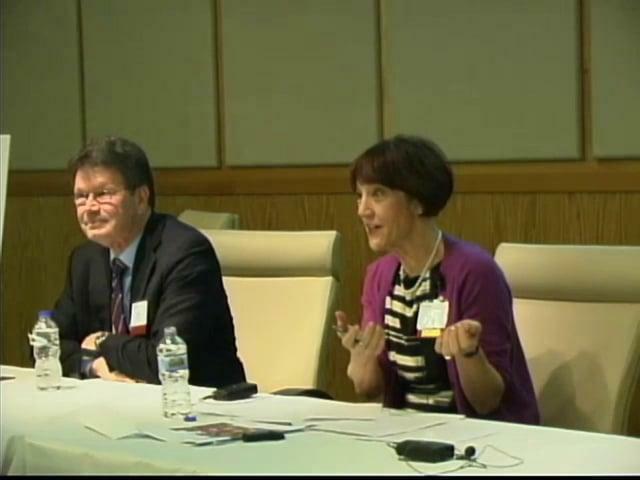 Panelists: Cornelia Grumman (moderator); Laura Bornfreund, New America Foundation; Bob Pianta, University of Virginia. Recorded Oct.
At 9 a.m. Wednesday, Aug. 21, EWA’s Emily Richmond talks with Phi Delta Kappa’s Bill Bushaw about a new Gallup/PDK poll on attitudes toward public education. Watch it here! The PDK/Gallup poll generated some media buzz, and when viewed alongside two other education polls released this week, reveals a populace that has an ambivalent view on the state of U.S. schools. 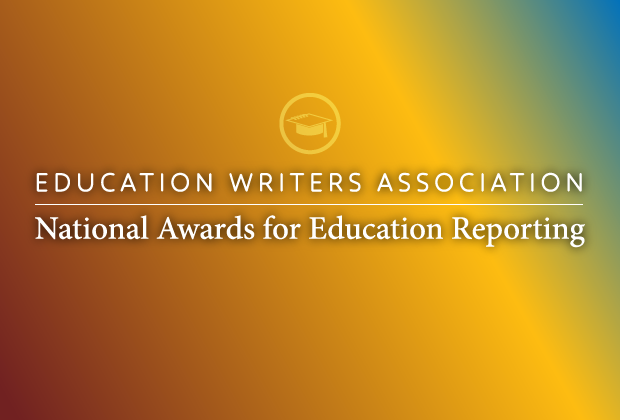 The American Educational Research Association (AERA) held its annual meeting in San Francisco in May, and we asked some of the journalists in attendance to cover a few of the sessions for us. Given that early childhood education is back on the front burner, it seemed like a good time to share this post from Martha Dalton of Public Broadcasting Atlanta. 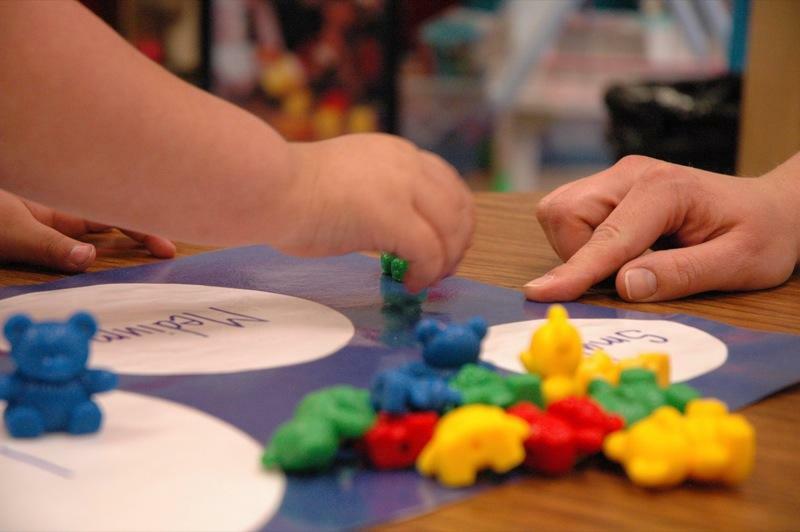 Crawling to a Consensus: Can States and the White House Agree on Early Ed? Research has shown that early education programs can significantly improve learning outcomes for the nation’s poorest students. With President Obama announcing a proposal to expand early education in the United States dramatically, interest in child care and pre-K has surged. But not all programs work effectively and states have had varying success implementing large-scale early-ed models. Can a national plan to enroll millions of children from low-income households in quality pre-K classes complement what’s working at the state level? How much of the U.S. gross domestic product is spent on education? How does that education spending break down for early childhood education, K-12 education and higher education? How much private spending is dedicated to education, compared to public spending? What is the link between higher education degrees and unemployment rates in the U.S. and other countries? 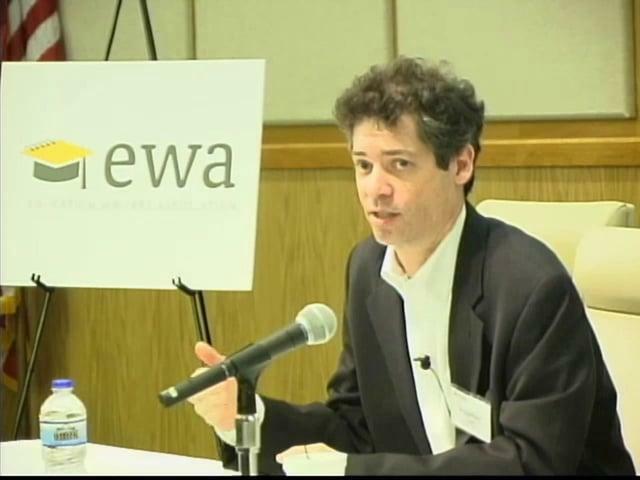 EWA’s 66th National Seminar, held at Stanford University, took place earlier this month. We asked some of the journalists attending to contribute posts from the sessions. The majority of the content will soon be available at EdMedia Commons. Over the next few weeks I’ll be sharing a few of the posts. Independent education writer Maureen Kelleher is today’s guest blogger. President Obama got the early childhood education world buzzing when he announced his ambitious plans to expand preschool during his State of the Union. But doubts remain. 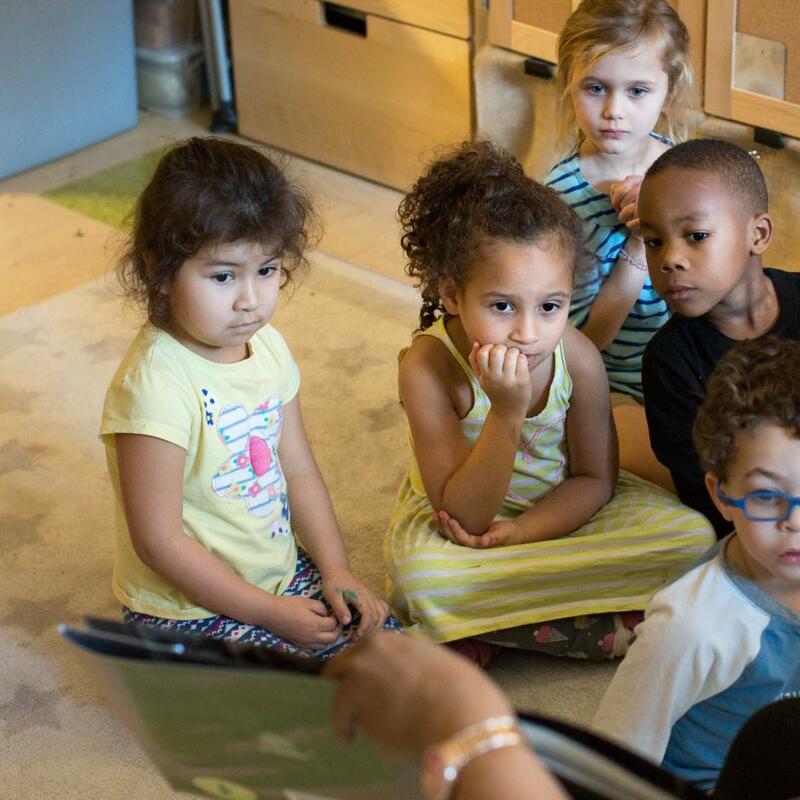 Would expanding universal pre-K lead to a top-down push for more academics at younger ages? 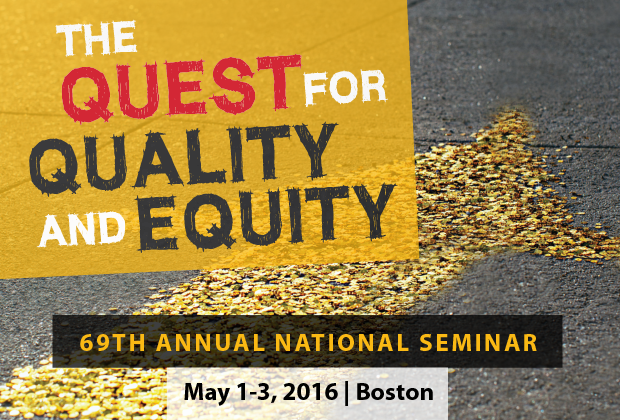 Do states have the funding to provide early childhood education for all who want it? 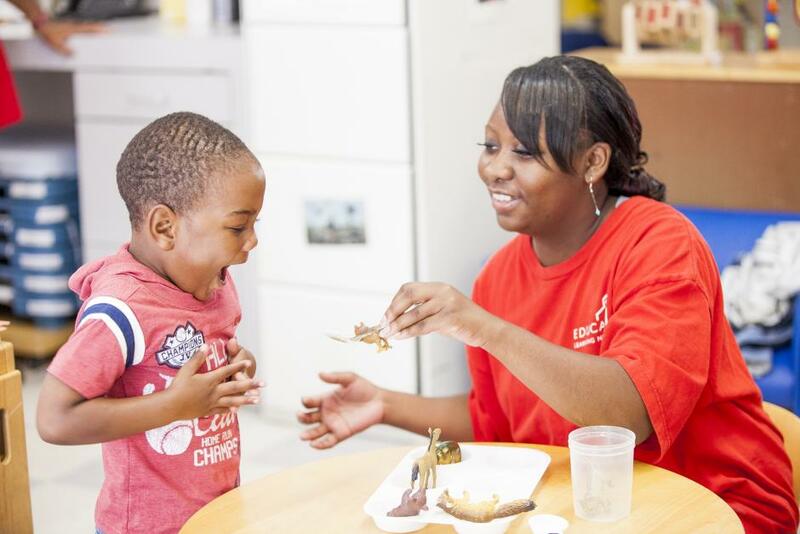 Can state programs and Head Start coordinate effectively? Panlists include: Ron French, Bridge Magazine; Bruce Fuller, University of California, Berkeley; Sterling Speirn, W.K. 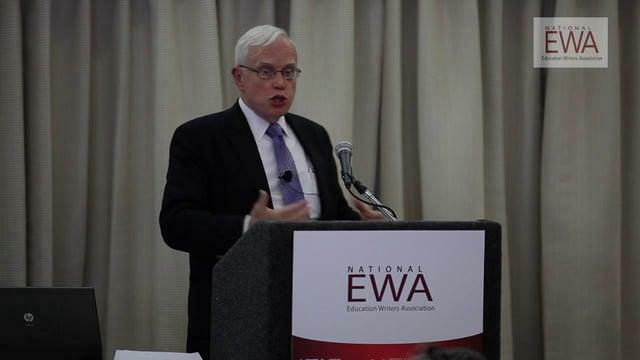 Dr. James Heckman, a Nobel laureate economist, is a strong proponent of investing early in children and disadvantaged families. 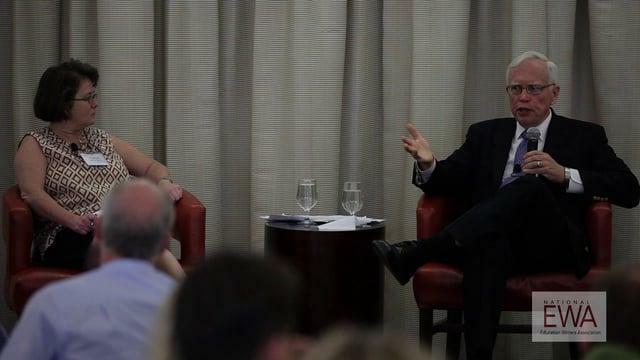 During a Q&A moderated by the Wall Street Journal’s Stephanie Banchero, Heckman fields questions on the the feasibility of basing policy around his research, paying for early childhood education, and the benefit of skills programs directed at older students. 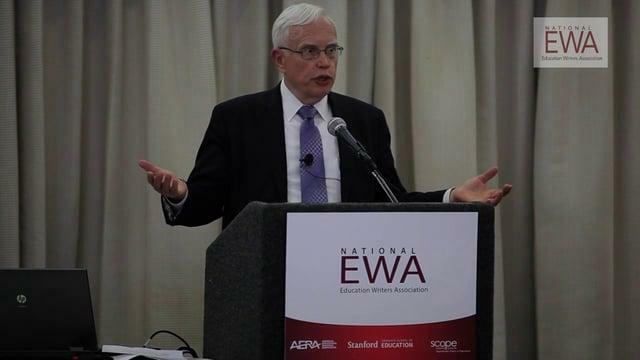 Dr. James Heckman, a Nobel laureate economist, is a strong proponent of investing early in children and disadvantaged families. As the talk continues, he discusses how early childhood interventions can affect skills acquisition later in life and the effects of education on achievement. As the Q&A comes to a close, Sec. 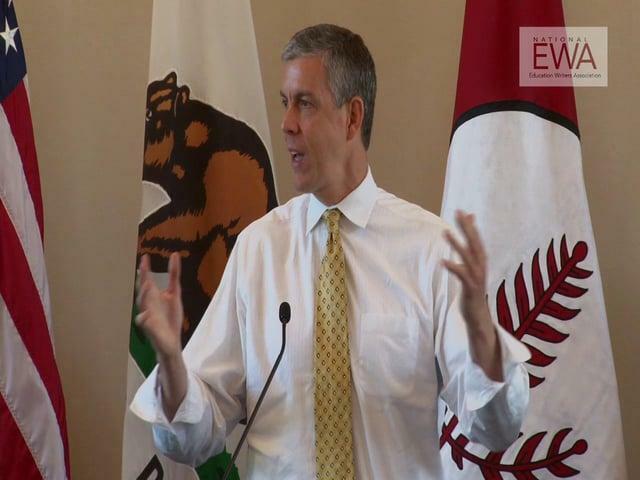 Duncan responds to questions about SIG funding for ‘parent trigger’ schools, whether federal policies invite cheating, and negotiating with states on common core standards. As the Q&A portion of his talk continues, Sec. Duncan fields questions on transparency at the Department of Education, erasure scandals, and the ongoing battle against rising college costs. 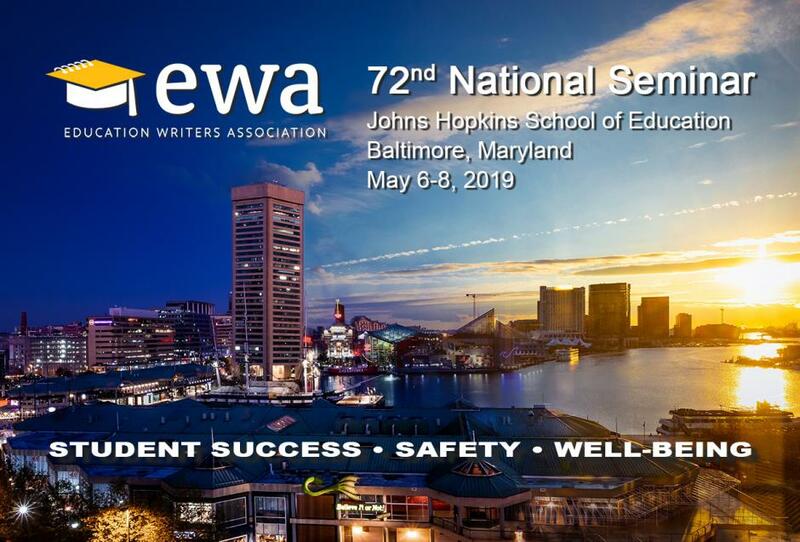 At EWA’s 66th National Seminar, the Secretary of Education talks about the value of early education, the importance of professional development for teachers and challenges facing turnaround schools. In part 2 of his talk, Sec. Duncan talks common core waivers, battling poverty and the the “staggering” impacts of violence on schools and communities. He also begins the Q & A portion by addressing his perception of a lack of diversity in the school reform movement. “Early Lessons,” a project of American Public Media reporter Emily Hanford, takes a look back at the Perry Preschool Project and contrasts it with what happens in many of today’s preschool classrooms. The National Institute for Early Education Research is based at Rutgers University. In addition to publishing the State Preschool Yearbook, NIEER conducts its own research on a variety of early-childhood education issues, including classroom quality, teaching practices and access. The website also has a news section that includes early learning-related articles from across the country. The National Association of Early Childhood Specialists in State Departments of Education is an organization of state education staff members who work in the field of early childhood. The organization is a good resource on issues such as state pre-K, Title I funds for early childhood, and trends in teaching and practice. The National Association for the Education of Young Children is a large association that represents professionals who work throughout the early-childhood education field. The organization’s accreditation system for early-childhood programs is the most widely recognized in the country. NAEYC also holds one of the largest education conferences every year and is a leading voice on early-childhood research and policy at the federal level. The National Association of Child Care Resource and Referral Agencies is a good source of information related to child-care options and funding at the state and local levels. Resource and referral agencies help families find programs that meet their needs and work to improve the quality of care through technical assistance and professional development. The Frank Porter Graham Child Development Institute at the University of North Carolina is one of the leading research institutes on early-childhood development, including issues related to children with special needs. Work from the center includes evaluations of early-childhood programs, rating scales for evaluating childcare and preschool classrooms, and research on achievement gaps. 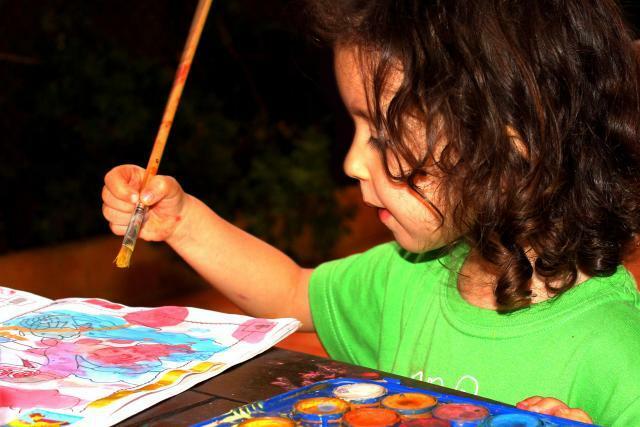 Preschools and kindergartens long have taught children “task skills,” such as cutting paper and coloring inside the lines. 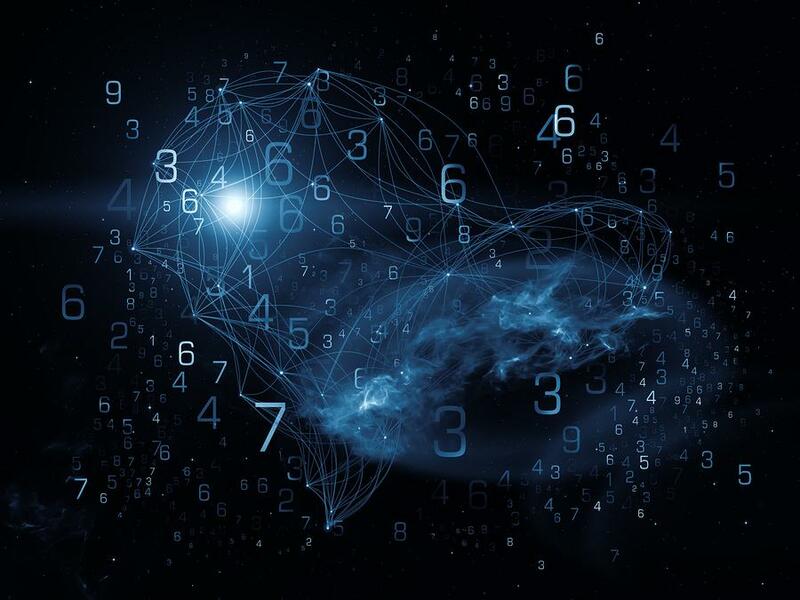 But new research suggests the spatial and fine-motor skills learned in kindergarten and preschool not only prepare students to write their mathematics homework neatly, but also prime them to learn math and abstract reasoning. More than 20 states now require measures of student achievement to carry significant weight in teachers’ effectiveness ratings – even in the earliest grades, in which children do not participate in state standardized testing. 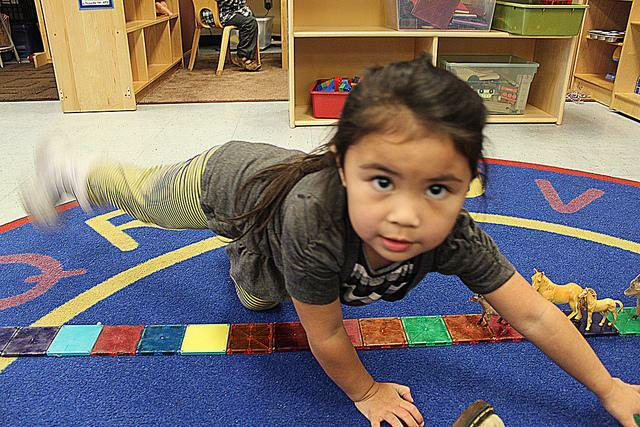 State financing for preschool fell by more than $548 million, or close to 10 percent, in the 2011-12 school year, the largest annual drop in a decade, according to a report released Monday. But the $77 billion measure, to be funded by a 94-cent tax increase on a pack of cigarettes, is no sure bet. And even if Congress does pass the measure, it would not require states to actually expand preschool offerings. Rather, it would give incentives for them to do so, much like the Affordable Care Act. But the preschool incentive may be even less compelling to states than Obamacare, since Preschool for All doesn’t help governors fulfill a federal mandate. 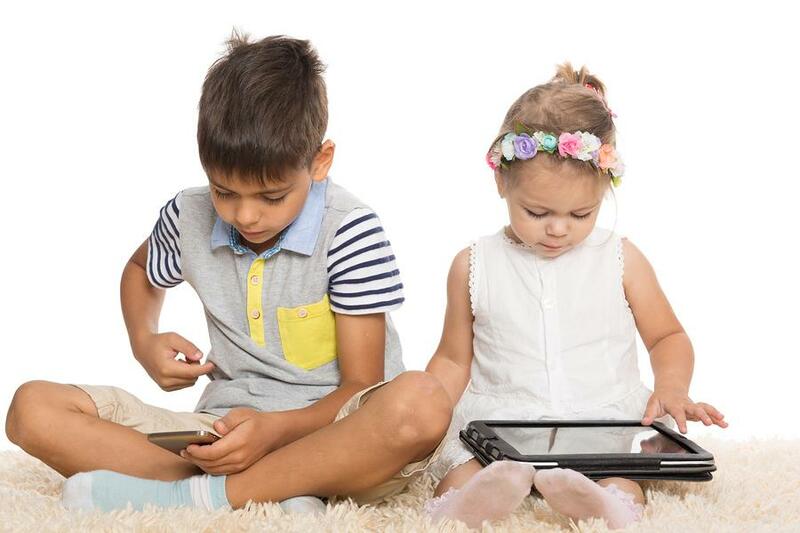 Young children—even toddlers—are spending more and more time with digital technology. What will it mean for their development? The Perry Preschool Project is one of the most famous education experiments of the last 50 years. The study asked a question: Can preschool boost the IQ scores of poor African-American children and prevent them from failing in school? The surprising results are now challenging widely-held notions about what helps people succeed – in school, and in life. Many Oklahoma children now arrive in elementary school so well prepared that some districts have overhauled their kindergarten curricula. A comprehensive study by the Pew Economic Mobility Project documents that in the U.S. today, few poor people become even upper middle class. To address these and other issues, the White House is considering a major step to boost early childhood education. 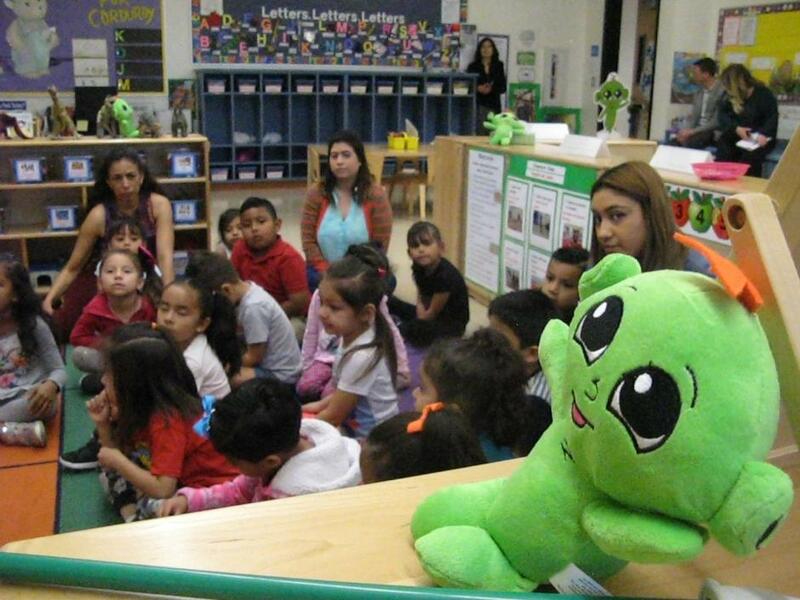 According to sources close to the administration, Duncan and the Department of Health and Human Services are outlining a plan to create universal pre-kindergarten for 4-year-olds from low- and some middle-income families — approximately 1.85 million children. California embarked on an ambitious experiment in 1996 to improve its public schools by putting its youngest students in smaller classes. Nearly 17 years later, the goal of maintaining classrooms of no more than 20 pupils in the earliest grades has been all but discarded– a casualty of unproven results, dismal economic times and the sometimes-fleeting nature of education reform. To save money on teacher salaries amid drastic cutbacks in state funding, many school districts throughout the state have enlarged their first-, second- and third-grade classes to an average of 30 children. Our report, Pioneering Literacy in the Digital Wild West: Empowering Parents and Educators, shows that while many digital products claim to teach reading, the app marketplace currently puts a heavy emphasis on teaching letters, sounds and phonics. A snapshot of the iTunes App Store’s most popular paid literacy apps showed that 45 percent targeted letters and sounds and half targeted phonics, but only 5 percent targeted vocabulary. And none of the iTunes paid apps in the scan focused on comprehension, grammar and the ability to understand and tell stories. The grant funding announced is part of “Race to the Top” money aimed at early childhood education programs. Colorado and four other states are getting the funding because they were finalists in last year’s competition. “Colorado is committed to helping ensure every child is ready for kindergarten and reading by the third grade,” Hickenlooper said. Illinois, New Mexico, Oregon and Wisconsin are also receiving funds. 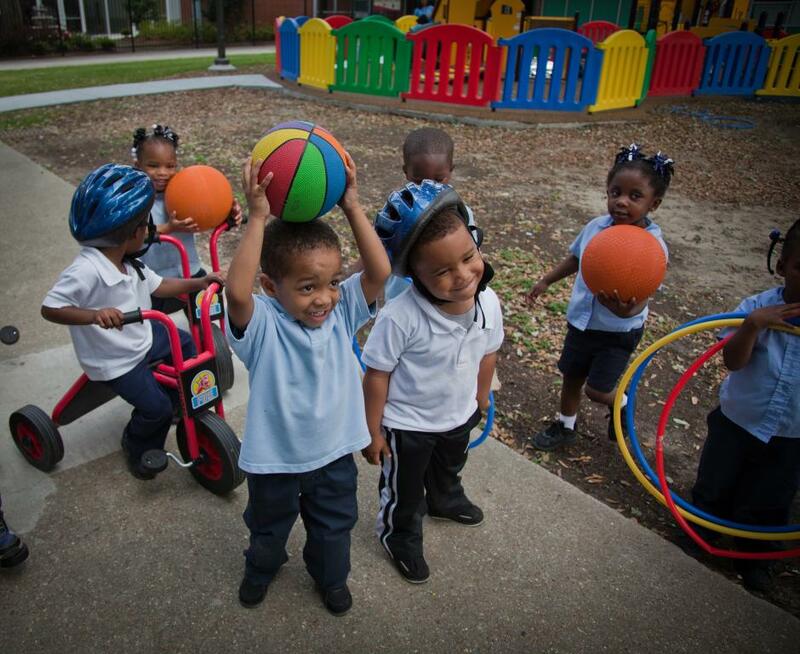 A Solution to Lost Early Childhood Opportunities in Mississippi? Mississippi needs the help: It has the highest rate of child poverty in the nation and some of the lowest standardized test scores. Licensing and oversight of small, family child care homes in Mississippi rank dead last in the country. And it’s the only state in the South that doesn’t fund pre-kindergarten. New theoretical ideas and empirical research show that very young children’s learning and thinking are strikingly similar to much learning and thinking in science. 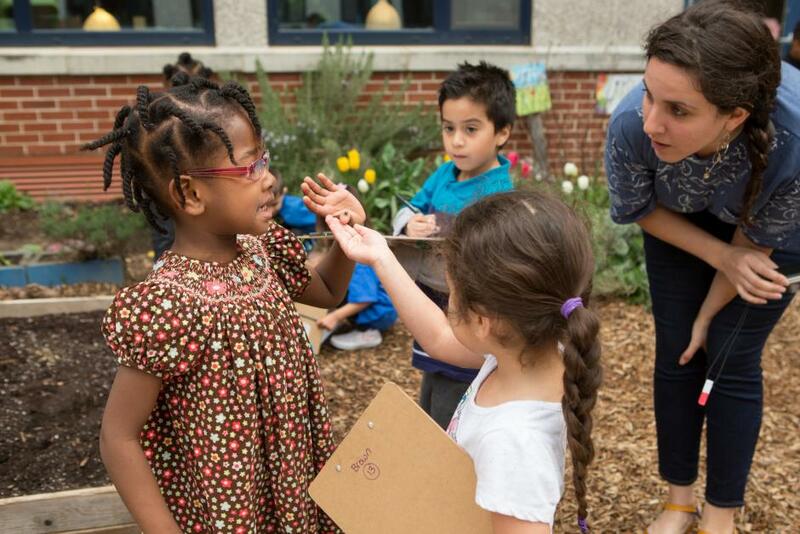 Preschoolers test hypotheses against data and make causal inferences; they learn from statistics and informal experimentation, and from watching and listening to others. The mathematical framework of probabilistic models and Bayesian inference can describe this learning in precise ways. These discoveries have implications for early childhood education and policy. In particular, they suggest both that early childhood experience is extremely important and that the trend toward more structured and academic early childhood programs is misguided. The share of kindergartners whose parents opted out of state immunization requirements more than doubled in the decade that ended in 2008, peaking at 7.6 percent in the 2008-9 school year, according to the state’s Health Department, raising alarm among public health experts. But last year, the Legislature adopted a law that makes it harder for parents to avoid getting their children vaccinated, by requiring them to get a doctor’s signature if they wish to do so. Since then, the opt-out rate has fallen fast, by a quarter, setting an example for other states with easy policies. To make friends, it turns out, children need to be able to carry out sophisticated social maneuvers, screening potential pals for certain positive qualities and making careful assessments about how much common ground they share. And in order to be a good friend—the kind that inspires loyalty and dedication—even a very young child must be not only fun to spend time with, but capable of being emotionally mature in ways that can be difficult even for grown-ups. This reported article examines the benefits of early education access, how North Carolina leads the nation in Pre-K options for ages zero to five, and what cuts to the state’s vaunted early education program can mean for future academic success among the poor students affected by these programs. A project of the National Institute of Child Health and Human Development, this study ran from 1991 through 2009. Analysis of the data, however, continues. The large team of researchers from multiple universities followed more than 1,300 children from their earliest years in various forms of child care into preschool and K-12 classrooms. The study’s findings—which included connections between children’s behavior problems and long time spent in center-based child care—sparked considerable controversy. Some commentators used the results to argue that mothers’ work outside the home hinders their children’s development. Others, however, have focused on the positive aspects of center-based care, which can include stronger cognitive skills, and have said such findings show that policymakers should focus on improving center quality. This 2012 report provides a detailed look at how early-childhood professions, working at various settings, are working to support young children as they move from one educational program to the next. Finding access to quality preschool is a problem for both low-income and middle-class parents. This piece describes the lengths that some families in New York go to when they can’t find spaces for their children in public school programs and can’t afford high-priced private preschools. This federally funded program is made up on three longitudinal studies that examine child development, school readiness, and early school experiences. The birth cohort of the ECLS-B is a sample of children born in 2001 and followed from birth through kindergarten entry. The kindergarten class of 1998-99 is a sample of children followed from kindergarten through the eighth grade. 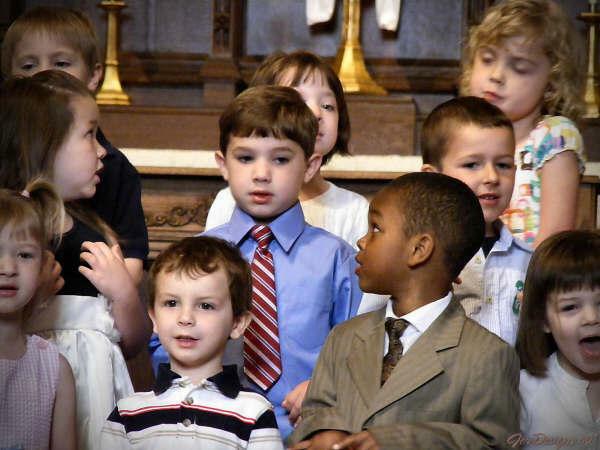 The kindergarten class of 2010-11 cohort will follow a sample of children from kindergarten through the fifth grade. It is important for reporters to know about these studies because researchers have used the data to investigate a variety of questions around the early years of schooling. This is an ongoing study of Oklahoma’s state-funded “universal” preschool program in the Tulsa Public Schools. Led by researchers at Georgetown University’s Center for Research on Children in the United States, the project found that the pre-K program has led to significant academic gains for participants. Gains among Hispanic and African-American children, and those from poor families were the greatest. 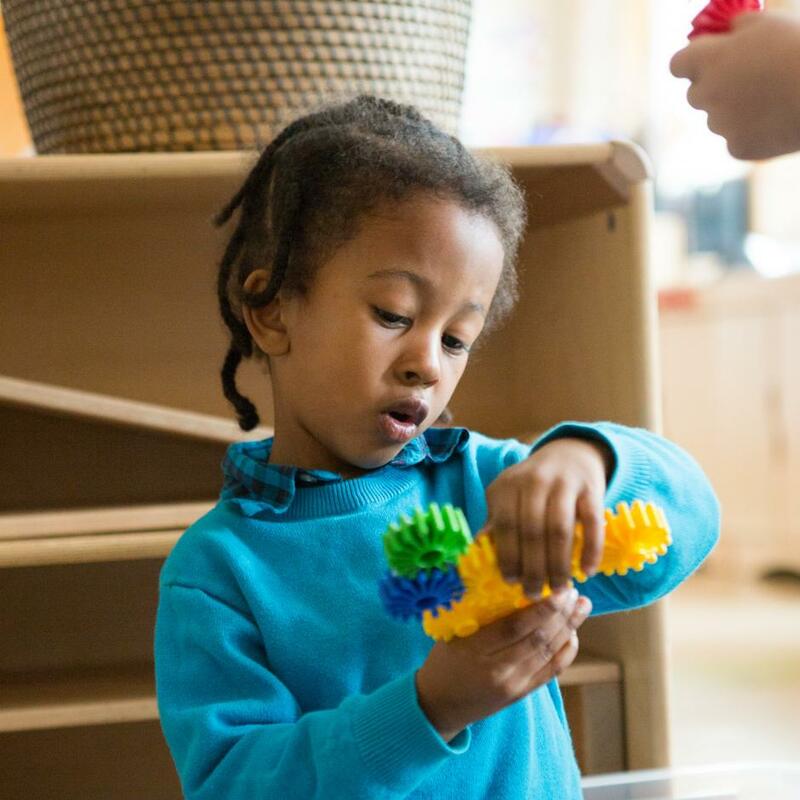 As with the Child Parent Centers in Chicago, preschool advocates have argued that the results show that quality doesn’t have to suffer when preschool is offered on a wide scale. Those in favor of targeting preschool to the most disadvantaged children focus on the results showing higher gains among children with low-socioeconomic status. 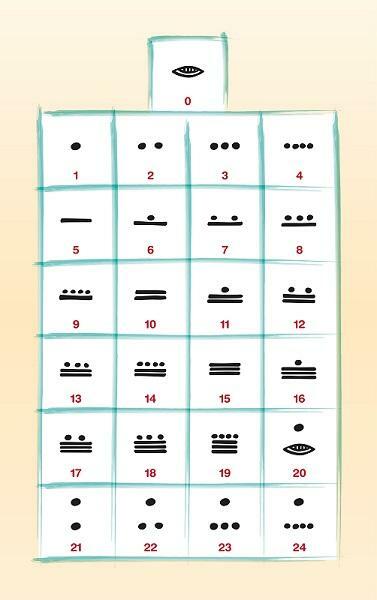 This resource is published each year by the National Institute for Early Education Research at Rutgers University. The report evaluates where state-funded preschool programs stand on a series of 10 indicators of quality, such as providing comprehensive services, or the level of training and education they require of teachers. Overall trends for the nation are also discussed. Education reporters have come to use the annual report to provide readers with a snapshot of what their state is doing regarding early childhood programs. This feature looked at the history of the federally funded Head Start preschool program and examined the ever-present questions over whether the program is effective. Released in 2007, this report provided a demographic profile of young Latino children in the U.S., and drew attention to the lack of access many Latino families have to early-childhood programs. This 2006 paper from University of Chicago economist James Heckman summarizes the research on the effects of early environments on child, adolescent and adult achievement—reinforcing the finding that “investing” early in life brings the greatest returns. Heckman’s ongoing research has fueled advocates’ efforts to convince policymakers that spending money on high-quality early learning and child development programs is wiser than many other economic development strategies. Reporters often write about new funding for early-childhood programs, but this four-part investigative series looked at how funding for preschool in New Jersey was being misspent. This article features the Nurse-Family Partnership, an effective intervention program developed by psychologist David Olds, which aims to improve outcomes among very poor mothers with young children. Home-visiting programs are one model used to support development of infants and toddlers, and many states spend money on home visiting, so it’s important for reporters to have an understanding of the research in this area. No study has been used to back up the lasting social and economic benefits of high-quality preschool for low-income children more than the HighScope Perry Preschool Study. Launched in 1962, the longitudinal study involved 123 African-American Ypsilanti preschoolers from Ypsilanti, Mich. 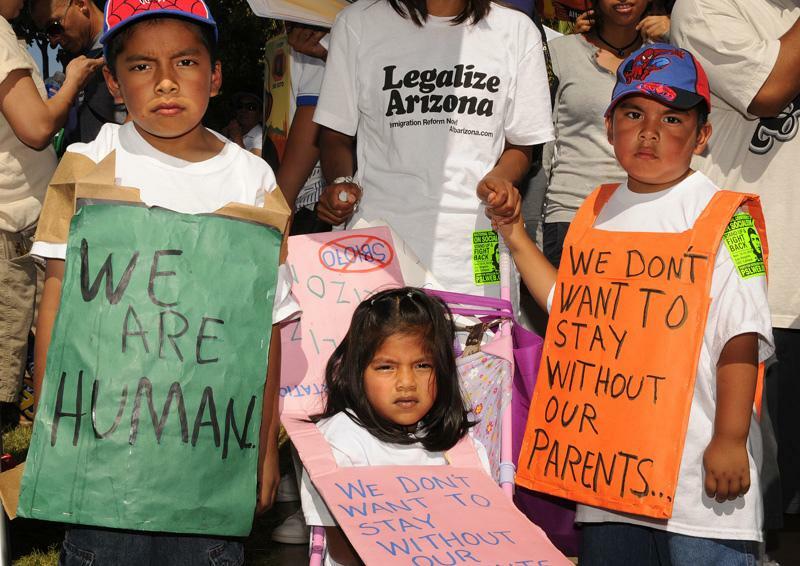 The children, all of them from families living below the poverty line, were assigned to “treatment” and control groups. At age 40, those who attended the small demonstration program in the 1960s were found to have higher rates of employment and homeownership, and lower rates of illicit drug use and arrests for selling illegal drugs, when compared with the sample of adults who did not attend the classes. Critics have said the sample size was too small and that it’s unrealistic to expect similar results from large-scale preschool programs without the same level of support. 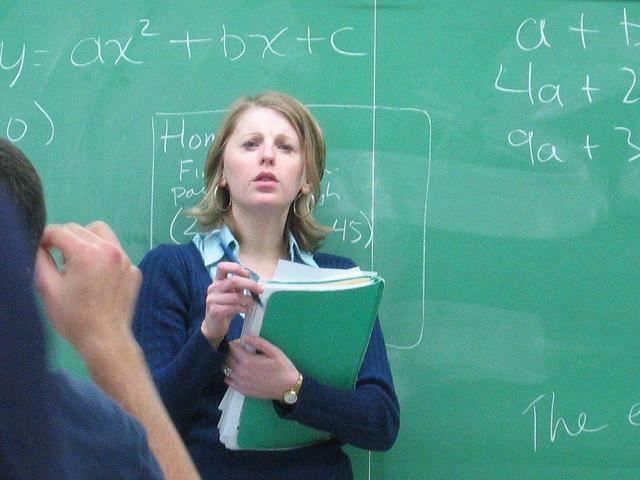 This 2000 report outlined the elements of well-designed preschool programs, including instruction in the four core content areas, and recommended bachelor’s degrees for teachers. It emphasized that young children are far more capable learners that previously thought. This report analyzed some of the findings from brain research and urged early-learning programs to focus on children’s emotional growth and development as well as their academic progress. A federally funded investigation of Chicago’s Child Parent Centers, which provide educational and family support services to children from preschool to 3rd grade. The centers are funded by Title I and have operated in the Chicago Public Schools since 1967. The study began in 1986 to investigate the effects of government-funded early-childhood education programs for 1,539 children in the Chicago Public Schools. 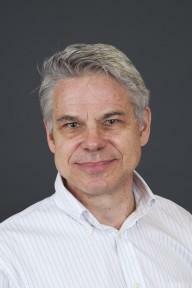 Led by University of Minnesota researcher Arthur Reynolds, the study has found that those who participated in the program beginning at age 3 showed higher levels of educational attainment, socioeconomic status, job skills, and health insurance coverage as well as lower rates of substance abuse, felony arrest, and incarceration than those who received the usual early childhood services. Many preschool advocates have said the results show it’s possible for public schools—not just small demonstration programs—to deliver early learning services that have lasting benefits. “The Promise of Preschool” is a documentary by education reporter John Merrow, the president of Learning Matters. The report followed the experiences of four families in New York, Atlanta, Bridgeport, CT and Paris, France, as they considered the range of early-childhood education options available to them. Merrow asked whether it was possible for families to find a consistent level of service in America when even public schools are struggling to maintain programs.